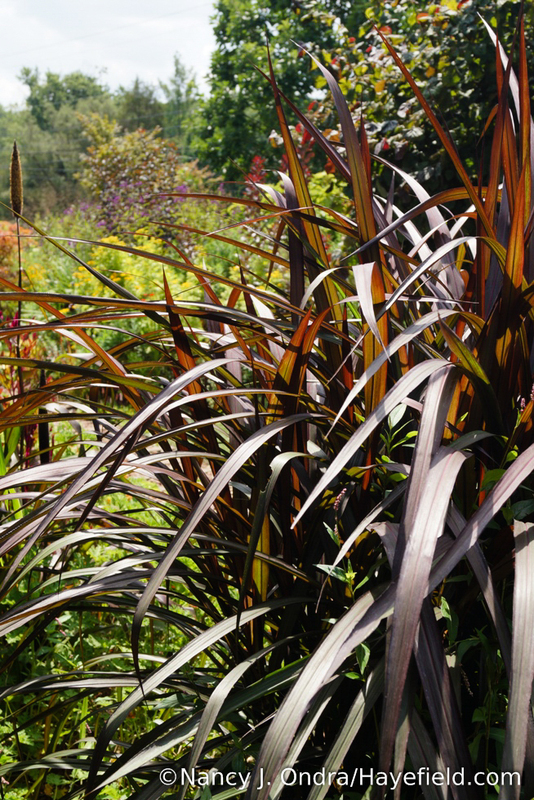 Welcome to the August edition of Garden Bloggers’ Bloom Day from Hayefield. Here in southeastern PA, we have been blessed with frequent rain this summer, so the garden is particularly lush right now. 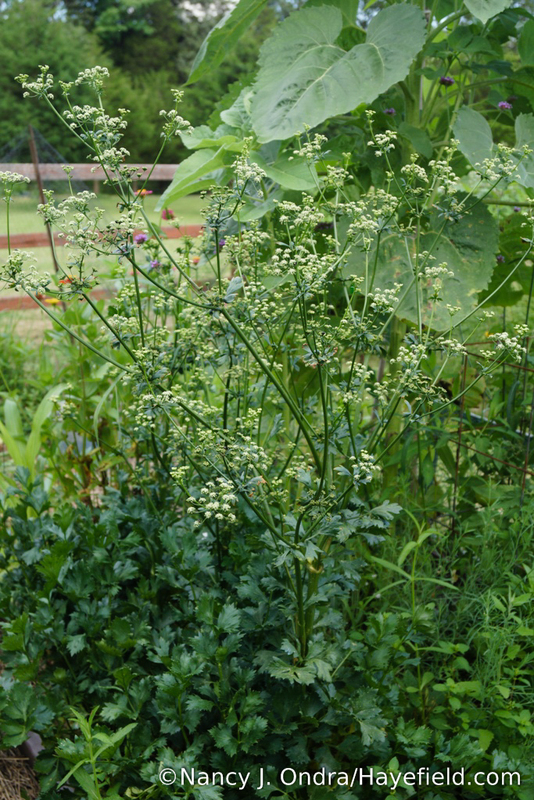 It’s been a busy time, trying to keep up with the vegetable harvest and collecting lots of interesting seeds. 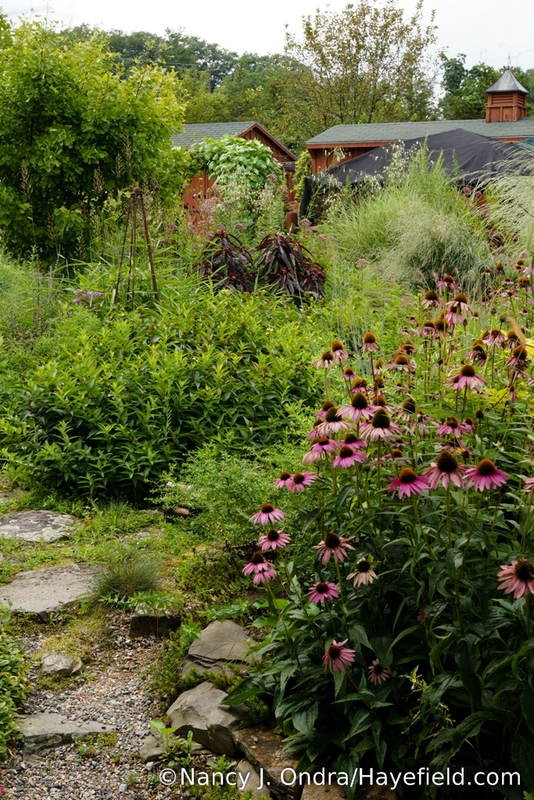 I like to give the whole garden a week or so of concentrated attention around now too: doing a thorough weeding, tidying up the edges, and making a final edit of everything else to balance heights and colors. As soon as that’s done, I can pretty much just stand back and enjoy the show for the next several months. According to the gardening column in our local paper, August is a “difficult” month, with most flowers being past their peak. To my mind, it’s the opposite: the start of the very best of the gardening season. 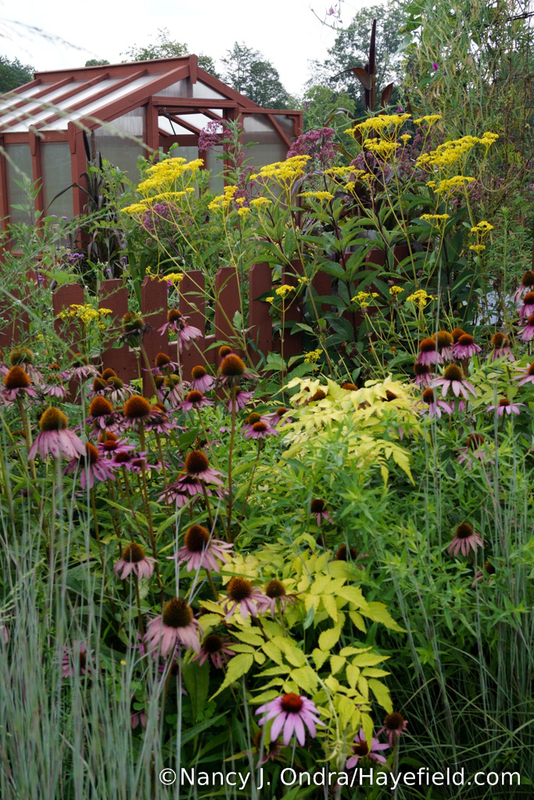 Here, August marks Stage One, highlighted by the flowering of three key perennials: orange coneflower (Rudbeckia fulgida var. 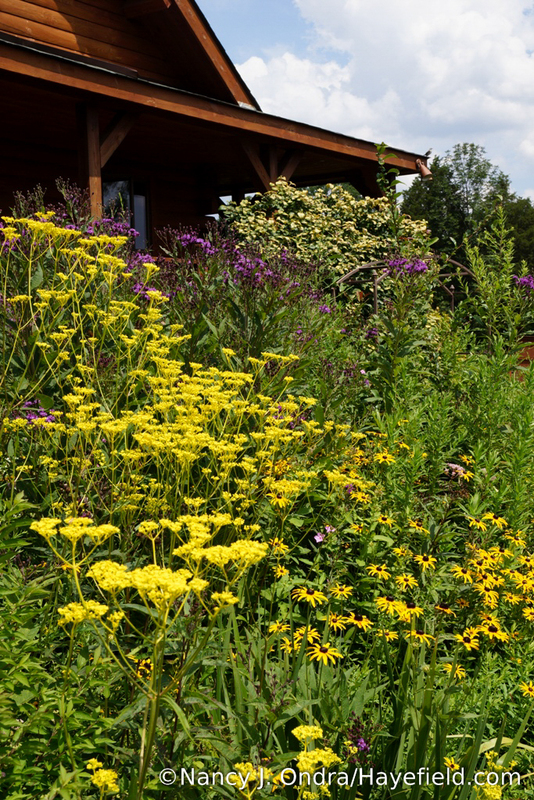 fulgida), golden lace (Patrinia scabiosifolia), and New York ironweed (Vernonia noveboracensis). I know orange coneflower (Rudbeckia fulgida var. fulgida) is common, and it can be a bit much in large expanses. 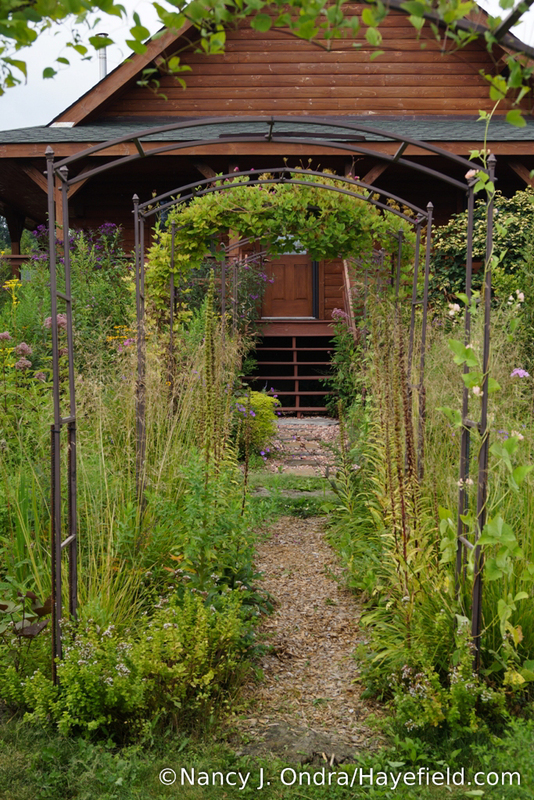 Weaving among taller partners, though, and interspersed with plenty of green, it’s a beautiful addition to the late-summer show. It self-sows freely, so I have quite a bit of it. 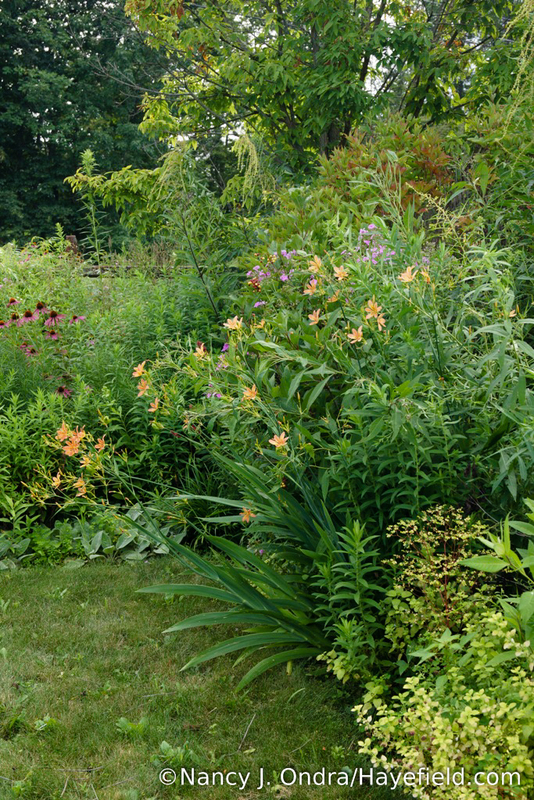 In late May, I cut most of it completely to the ground, but I leave some of the mid-border plants alone. That produces a nice multi-layer effect (as in the above photo) and extends the bloom season too. Even a single clump of golden lace (Patrinia scabiosifolia) tends to have a layered look without pruning, due to its branching habit. If you let it self-sow, the multi-level effect is particularly noticeable. There’s a great deal of variation among the seedlings: Some are more compact and densely branched, while others are taller and much more open. 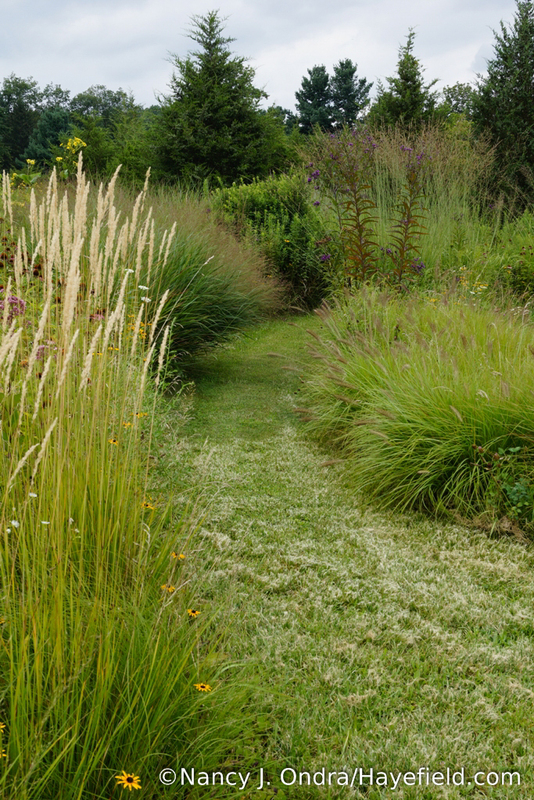 A mix of the forms allowed to seed through beds and borders really does create a lace-like effect. 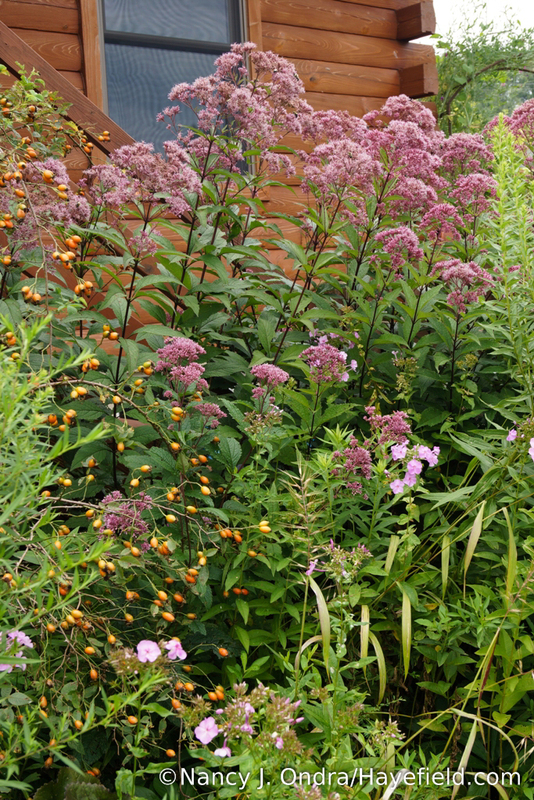 The height and color of golden lace make it a perfect partner for the sumptuous purple flowers of ironweeds (Vernonia). To be honest, as much as I adore the color of ironweeds, I’m pretty ruthless about keeping them limited in the garden (well, “limited” to a few dozen), partly because they self-sow so freely and partly because they’re so prone to rust here. 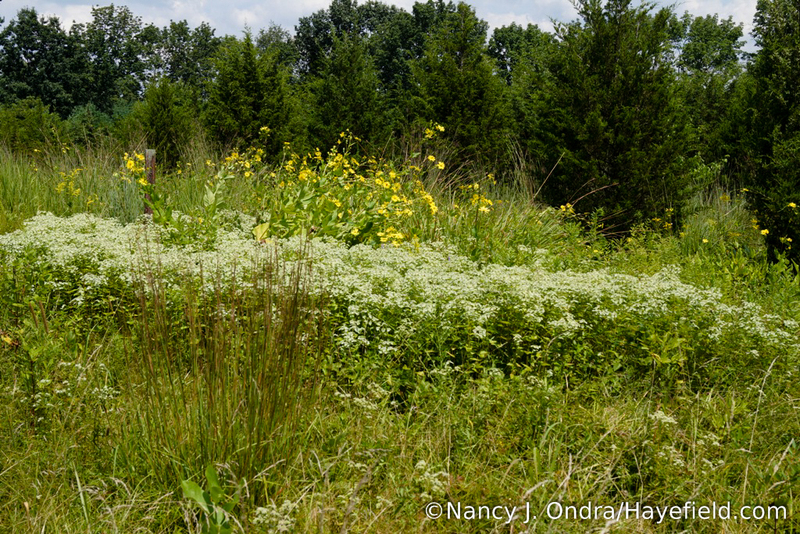 I let them do what they want in the meadow, and they’ve happily made themselves at home out there. Back to the garden, though…there are many other beautiful and/or interesting things contributing to the show right now. Let’s start with the annuals and tender perennials. 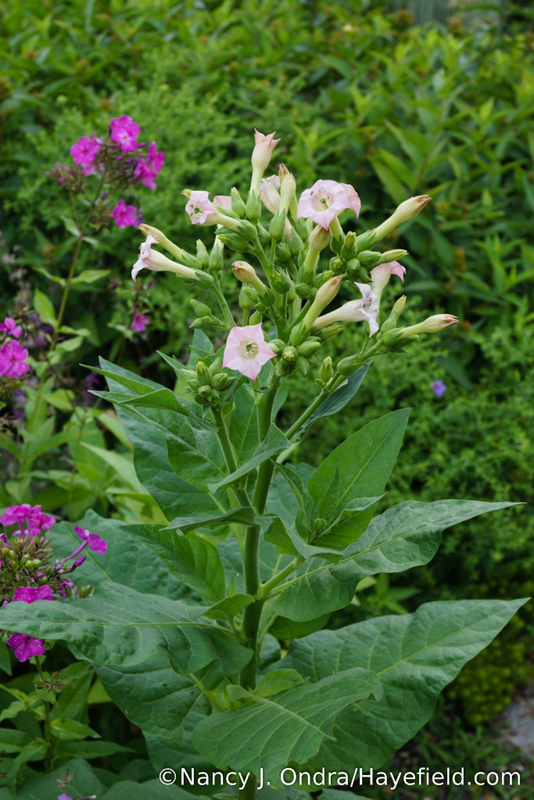 Tobacco (Nicotiana tabacum): looking nice now, but not something I’d make a point of growing. When you sow the seeds of the variegated version, though, you get a lot of solid-green seedlings, and I didn’t want to toss them all. 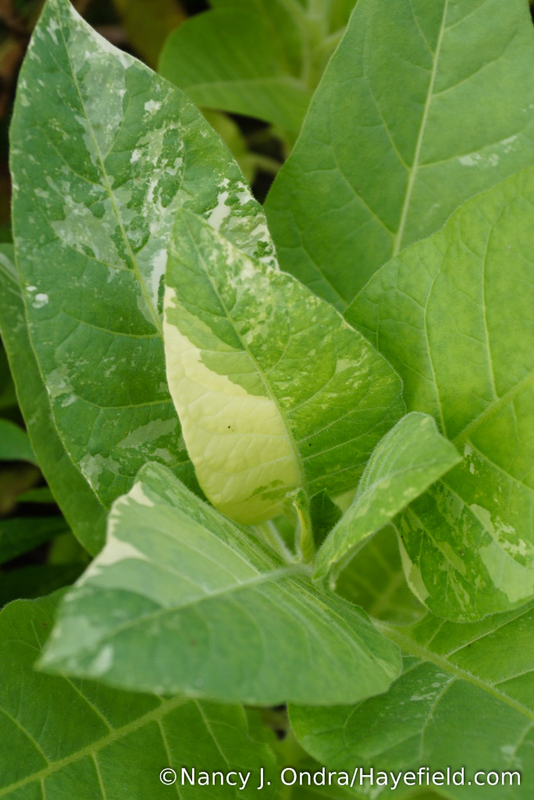 Variegated tobacco (Nicotiana tabacum ‘Variegata’): that’s what I wanted! One seedling with decent markings finally got established. I hope it flowers and sets seed before it gets eaten by the hornworms. ‘Silver Anouk’ Spanish lavender (Lavandula stoechas): new for me this year. It’s a terrific color, and at least twice as tall as any of my other lavenders. Whiteleaf leather flower (Clematis glaucophylla) is very happy with its new arbor. It grew up one side, reached across the top (with regular guidance), and has sprawled nearly to the ground on the other side. 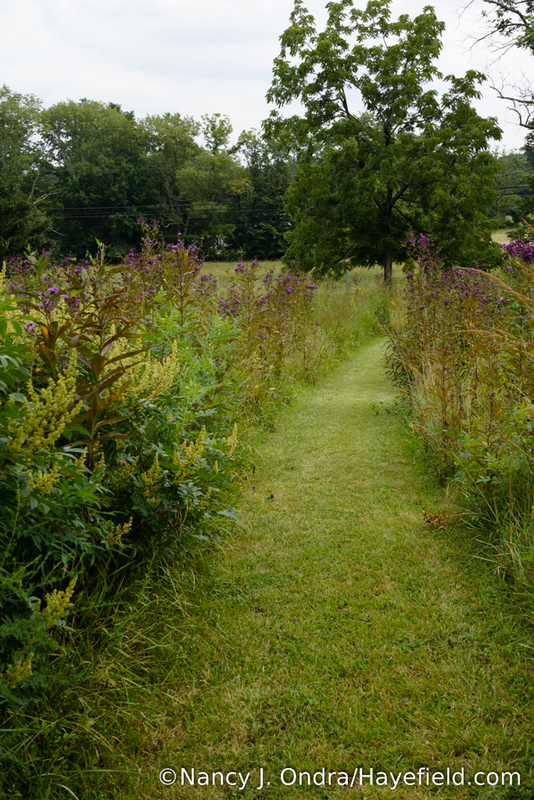 There are some pretty things out in the meadow, too, besides the purple ironweeds. I haven’t been shooting many combinations recently, because I’m waiting until I finish the garden cleanup. I did grab a few, though. 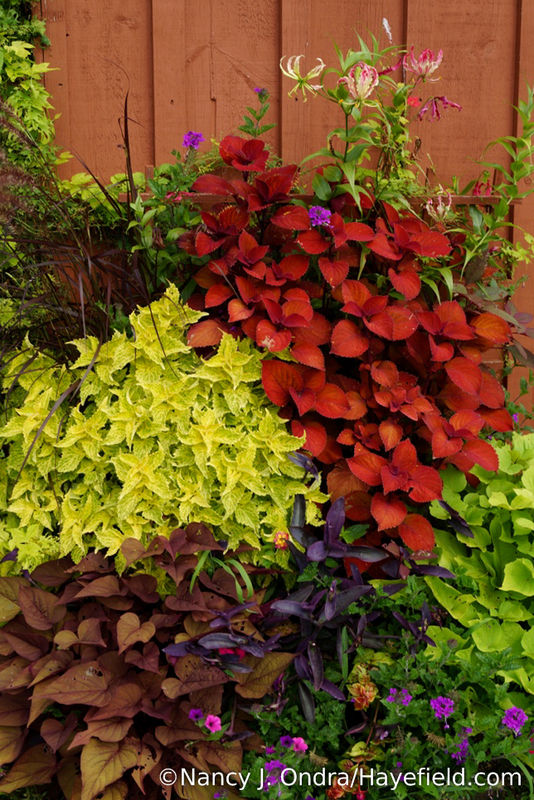 Orangey ‘Sedona’ used to be my must-have coleus, but I have a new favorite: ‘Campfire’. Look at that intense color! 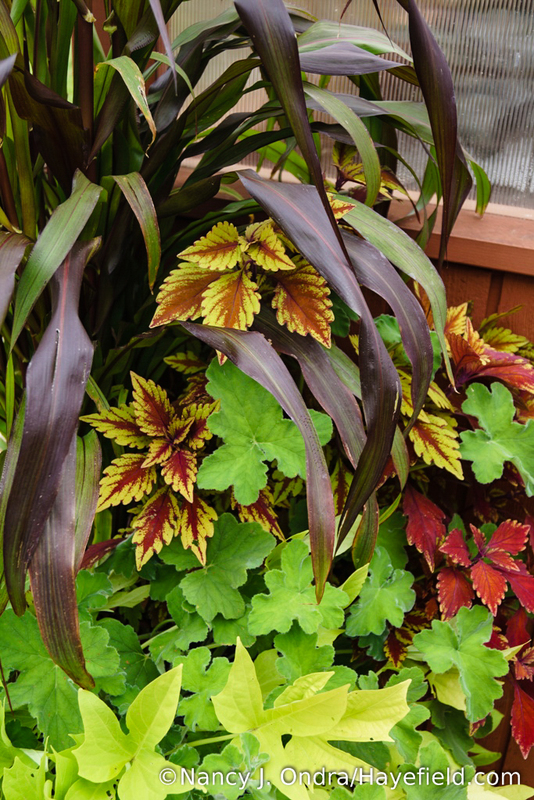 Unlike ‘Sedona’, it is staying a solid orange-red, with no pink tints, in this full-sun planter. 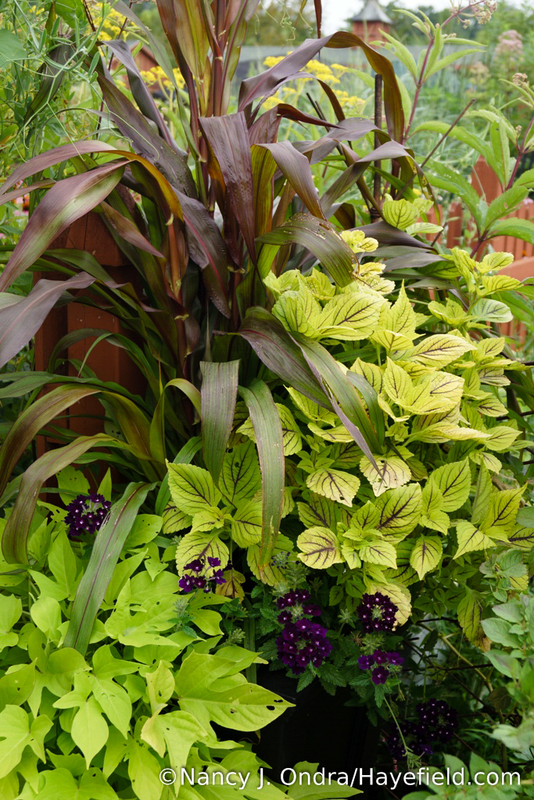 Companions here include gloriosa lily (Gloriosa superba), yellow ‘Main Street River Walk’ coleus, purple queen (Tradescantia pallida ‘Purpurea’), and ‘Sweet Georgia Heart Red’ sweet potato vine (Ipomoea batatas). 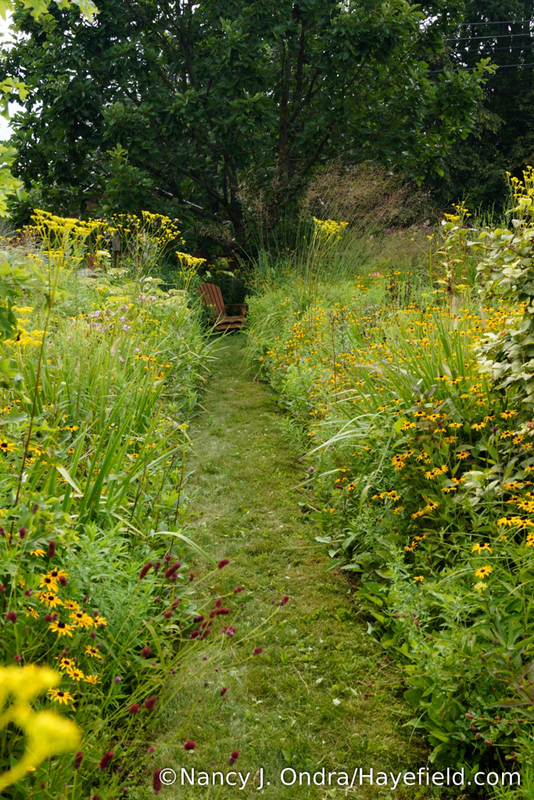 What really pleases, and amazes, me is how good the garden and meadow areas look as a whole. Sometimes I just wander around and take it all in. Here’s a quick trot through the highlights. Well, that was quite a stroll for a late-summer day, so it’s time for a break. 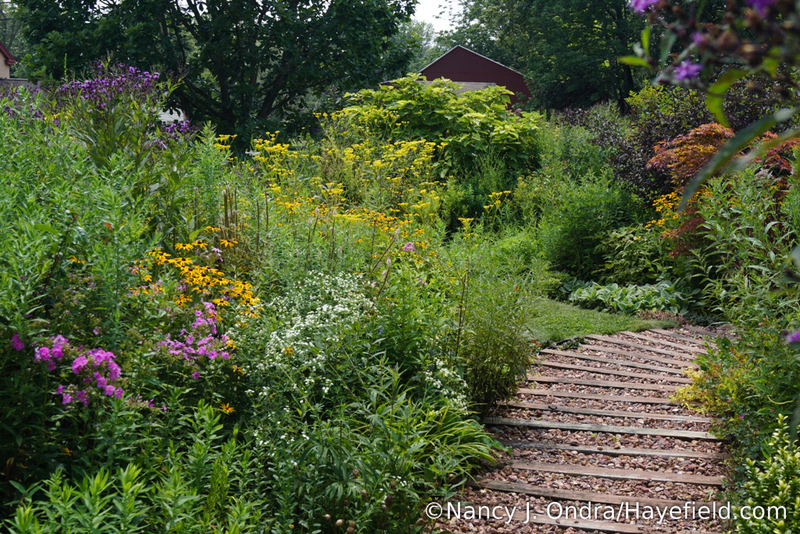 Find yourself a patch of shade and chill out for a bit, then check out more summery garden splendor from the participants in this month’s Garden Bloggers’ Bloom Day. You can find the list at Carol’s main GBBD post at May Dreams Gardens. Thanks for visiting! Thanks! Happy Bloom Day to you. 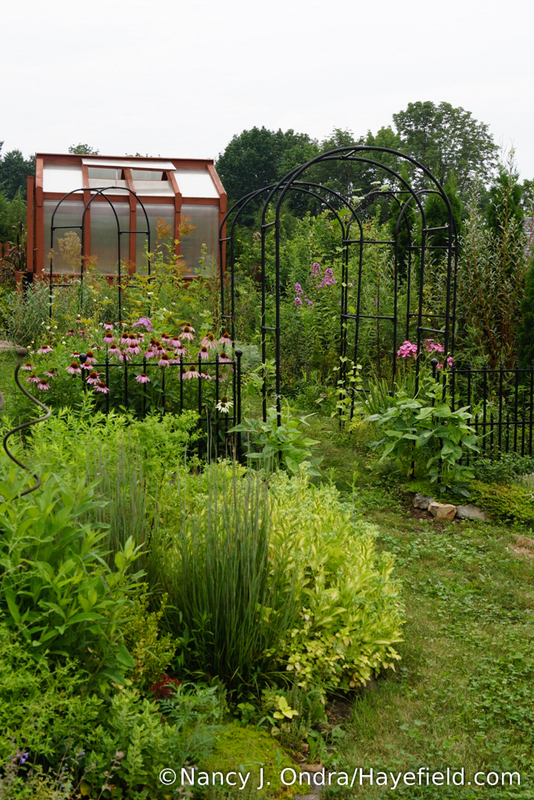 Your garden looks great for August. Must be all that rain. I wish I could say the same. I love Iron Weed. I have tried to get it established here but have failed miserably. I think it might be because I don’t have full sun for it. I have wanted it ever since I found a clump in the wild and it had a comma butterfly chrysalis on it. 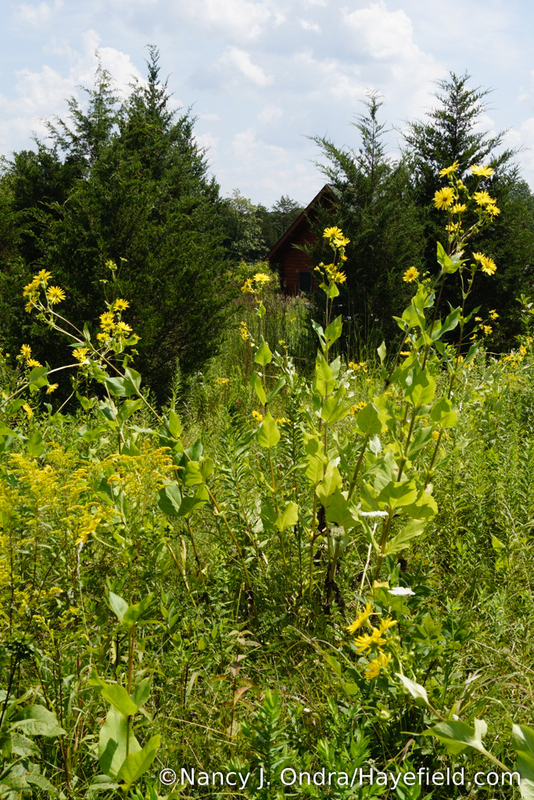 What is that yellow fruit by the Joe-Pye weed? 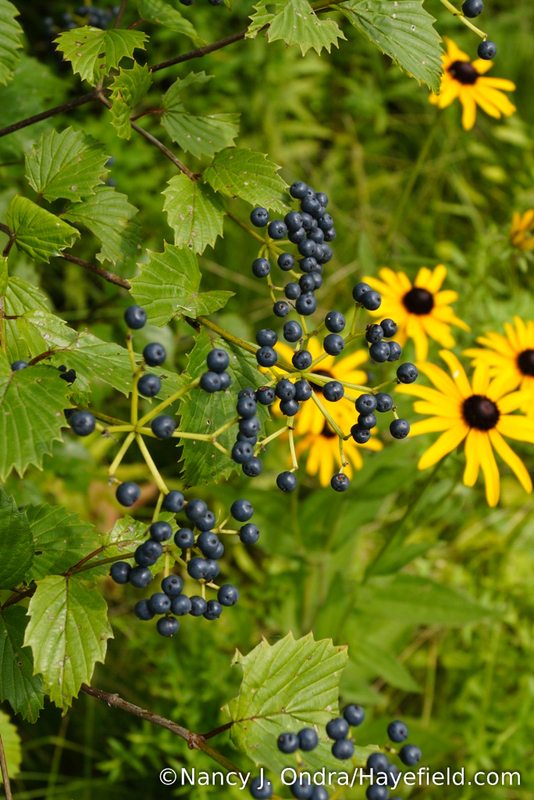 The berries on my Arrowwood are eaten almost as soon as they appear it seems. I love that big ole clematis. 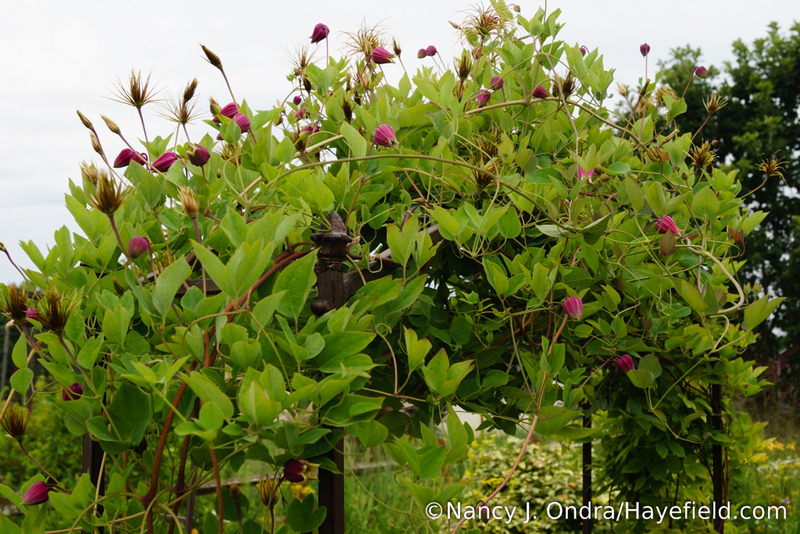 I finally have a clematis (Ernest Markham) going over a small arbor by the side gate. Can’t tell you how many I have tried. Cute picture of Duncan (?) using the shade of the solar panels. Double duty for those panels. I hope you are having a good time away. Happy GBBD. Hey there, Lisa! 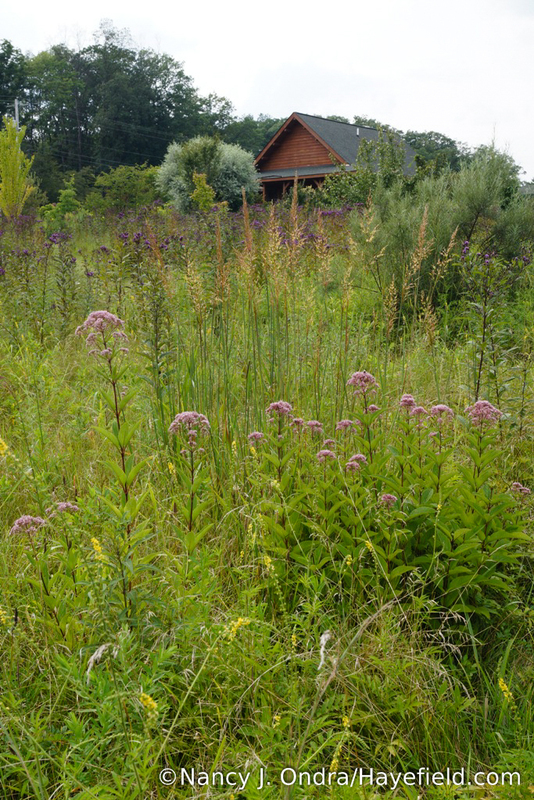 Yes, you may be right about the shade being a problem with ironweed in your garden. The fruits in the garden shot of Joe-Pye are the hips of Rosa achburensis. The berries on my Blue Muffin arrowwood don’t last long either; the birds are always busy down there. Congrats on the clematis! They do require some patience, don’t they? And yes, it has worked out great to have that shade structure that also supplies all of our electricity. All the best to you! What a great way to start my morning! 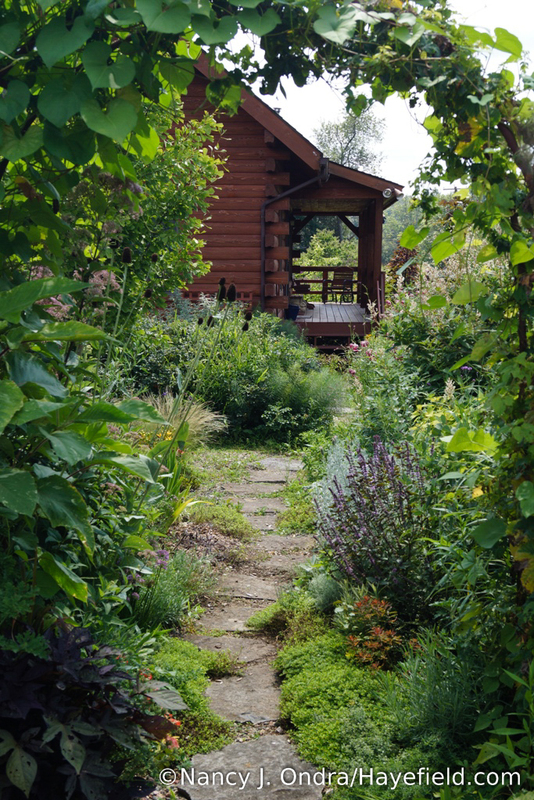 A cup of coffee and a virtual stroll through your garden. You inspire me and teach me so very much! Thank you!! Hi Liz! 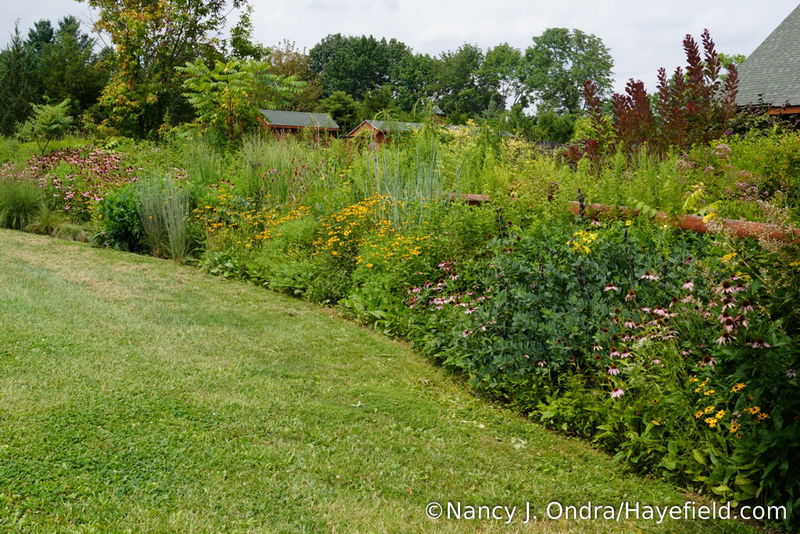 Thanks so much for joining me on the virtual garden walk, so you could see it in some sun. The actual garden is very dark and drippy today. Nan, as always, stunningly beautiful! All of your flowers, wild and cultivated, are such a labor of love that photos of them give me a deep feeling of peace when I see them. Wishing you a peaceful end of summer. Thank you for that lovely thought, Jean. I wish the same for you and yours. 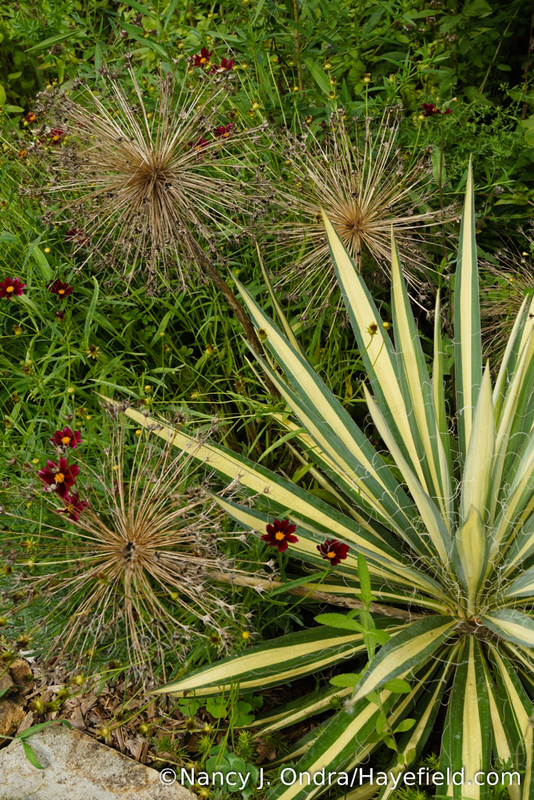 Well, your garden certainly overcame the dry conditions it suffered from last year! I could go on and on with comments but I will stick with two questions. Gosh, the despair of last year’s drought is a distant memory. 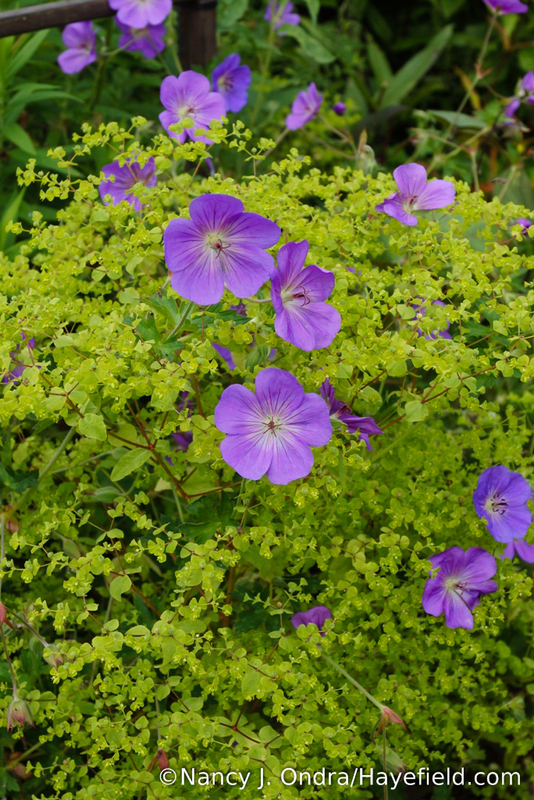 At the moment, I can’t think of any plants that I ended up losing, or that are showing problems this year. Oh, well, except for the white ash trees, which are already under attack by the ash borers. If I think of anything that might be useful to you, I’ll let you know. Delightful! How wonderful to browse the pictures, but hard to take in all that beauty at once! Yes, it’s a lot, isn’t it? I appreciate you taking the time to stop by today. 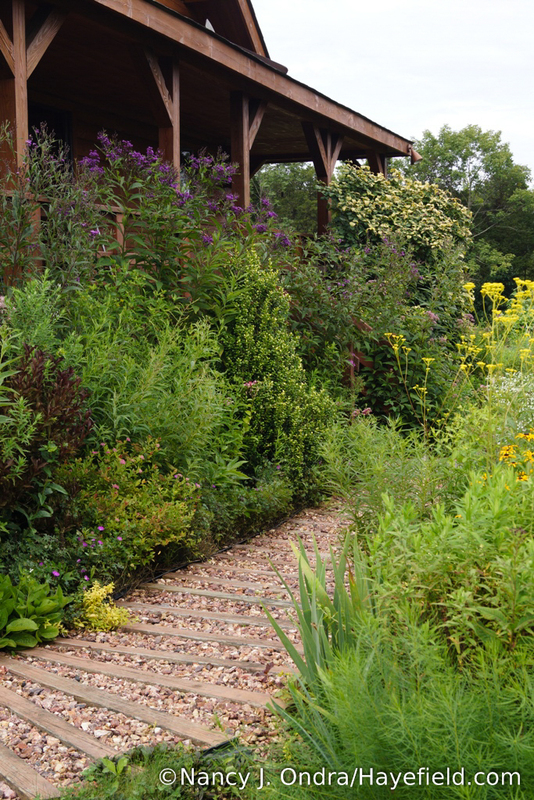 Always such a pleasure to take a stroll through your garden. 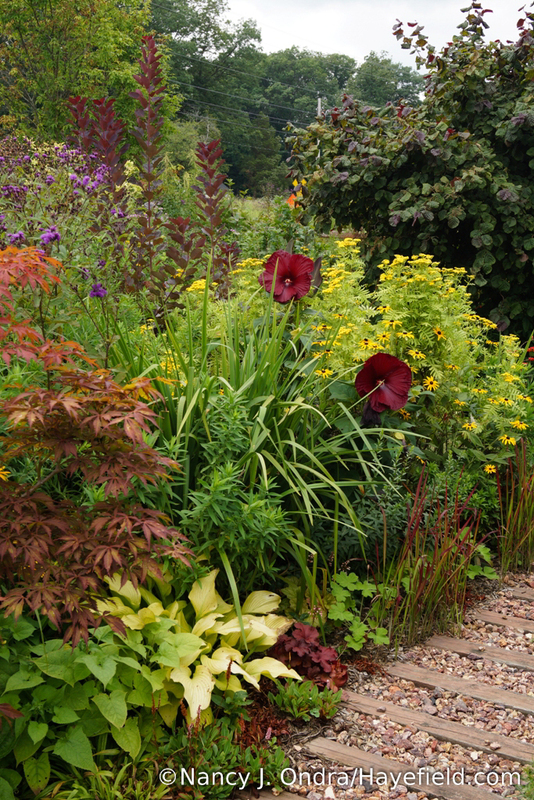 Just stunning and you certainly prove that August gardens have lots to offer. Hi Linda! 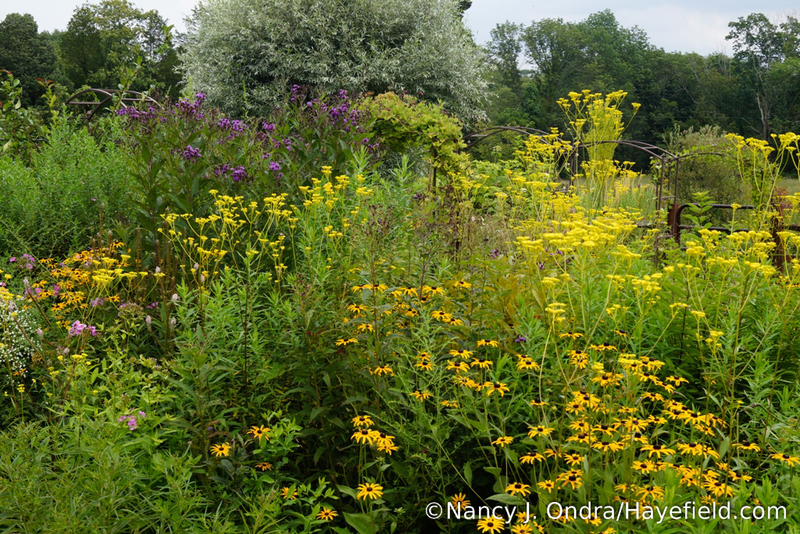 It’s exciting to think that there’s still so much more to come: the goldenrods, and asters, and grasses, and fall color…. Absolutely beautiful. Everything seems so happy in its place and content with its neighbors, color, height flowing throughout. Your workload is unimaginable. 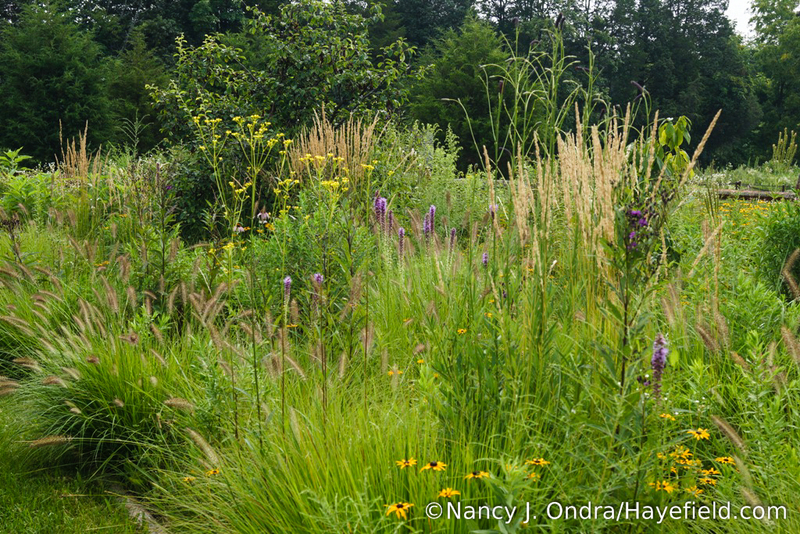 How do you keep the stilt grass and Japanese honeysuckle out of your meadows? They’re spectacular. 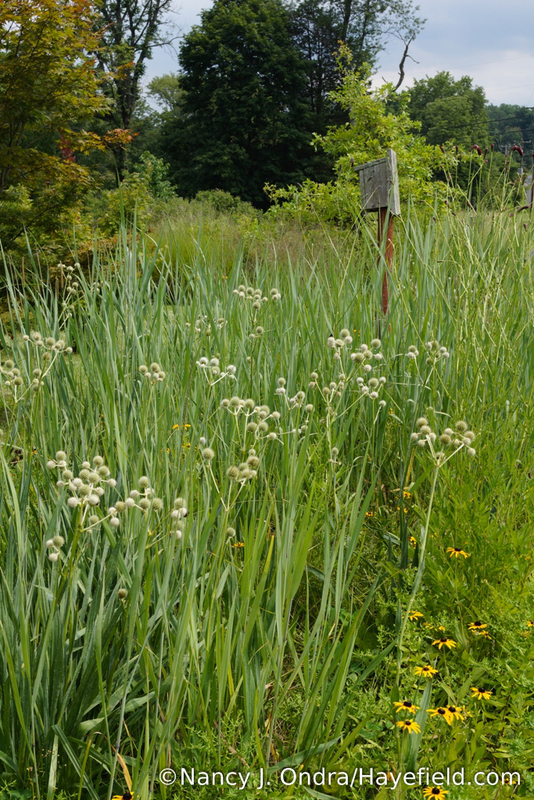 Have you ever grown Kalimeris incisa in the beds? It looks lovely with many of the combinations you’ve shared with us here. Thanks for all the wonderful suggestions you’ve contributed to my own gardens. Thanks, Sally! Interesting that you mentioned stilt grass; it was horrible last year but I haven’t noticed it as much this year. It’ll probably be more visible when it heads to seed soon. And the Japanese honeysuckle–well, it’s out there too, especially along the back hedgerow. 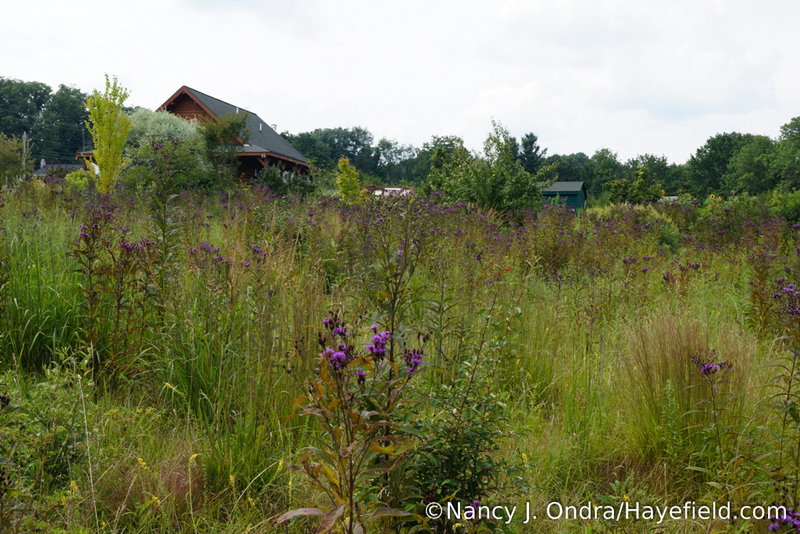 There, I mow 3 or 4 times a year; the rest of the meadow, I usually mow only once or twice. 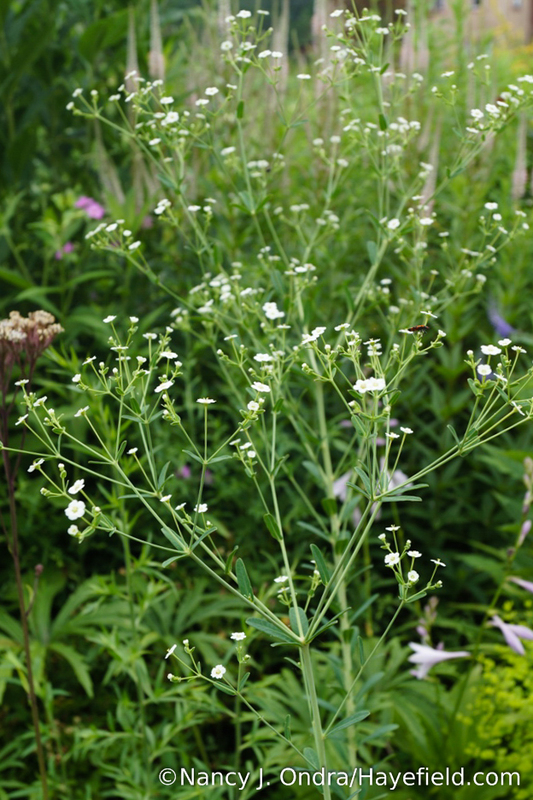 I was working around Kalimeris incisa in another garden today, where it was growing next to the pink flowers of Allium ‘Millennium’ in a very pretty pairing. Somehow I’ve never warmed up to it here, but maybe I’ll try it eventually. All the purple and yellow blooms look so good together! Love the lilies, and that must be the tallest sunflower in the world! It’s certainly a bright and cheerful pairing. I’m really looking forward to the rich purple New England asters joining the show in the next few weeks. 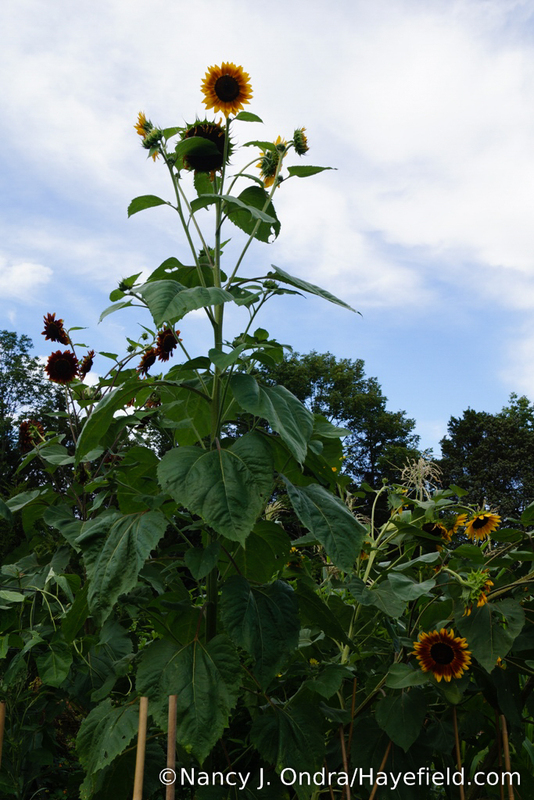 I know some sunflowers (like ‘Russian Mammoth’) can get even taller than ‘Evening Shades’, but these are definitely the largest ones that have ever flowered here. Happy Bloom Day right back to you, Lea! I appreciate that your gardens are wildlife friendly. Bet you have lots of birds, bees and butterflies. My yellow lace (Patrinia scabiosifolia) attracts sooo many different kinds of bugs…Love it even though it isn’t native. Plant it and they will come! 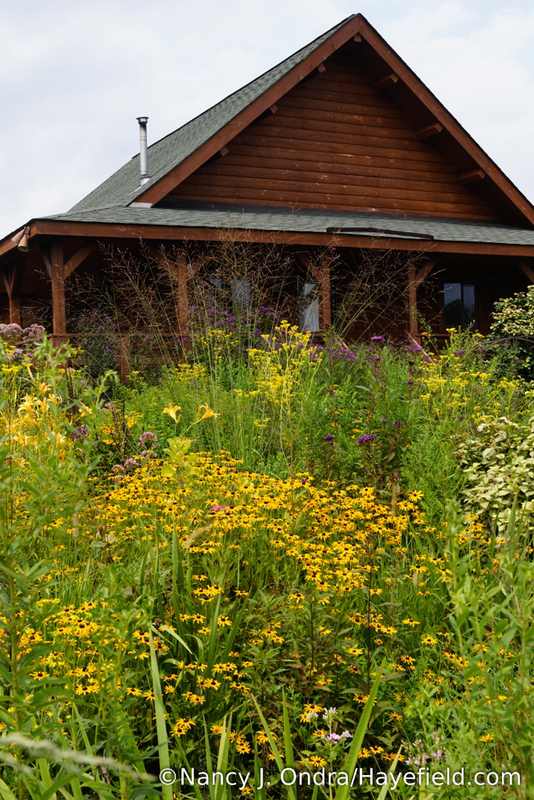 Can’t understand why more people don’t plant native (and other) flowers, grasses, shrubs and trees. Grass does nothing for wildlife! Thank you for what you do. You’re not kidding, Cora: the patrinia is always abuzz with a wide variety of insects–only surpassed, I think, by the mountain mints in the meadow. And wow, I’d meant to mention how abundant the butterflies are this year. I’ve been even more aware of monarchs this summer, since I’ve been doing a daily count for the Monarch Watch Citizen Scientist Program. I’m glad I don’t have to count the various swallowtails and skippers too: that would be a full-time job! Inspirational as always. Enjoying your patrinia which I started from seed last year (via HPS). That red-leaved peach is stunning! Good to hear from you, Tiiu. I’m happy to hear abut the patrinia. I need to start collecting seeds from that peach tree. I was given to me as a seedling maybe 15 years ago but has been setting fruit for only the past few years. It would be great to get more started, and to be able to share the seeds with others. 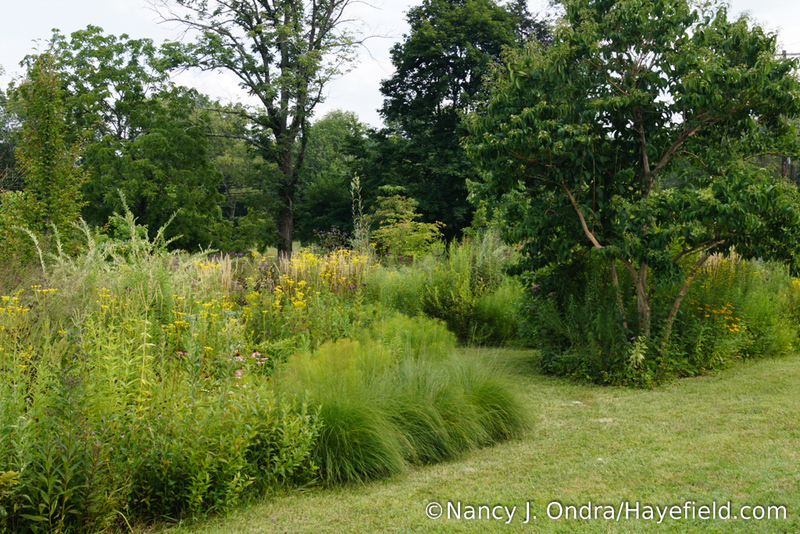 I always enjoy your garden tours via this blog. 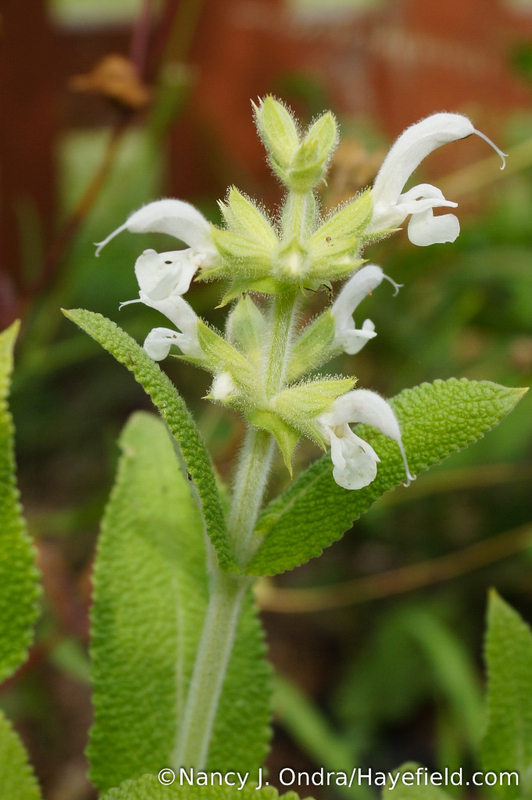 There is always some plant which I have not seen before and each trip is an adventure! Enjoy these August days. Hi Layanee! It is as un-August-like as you can imagine here today. I was out working in other gardens for many hours but finally needed to come home to get warm and dry. I hope you and your own garden are dry for this Bloom Day. Amazing! 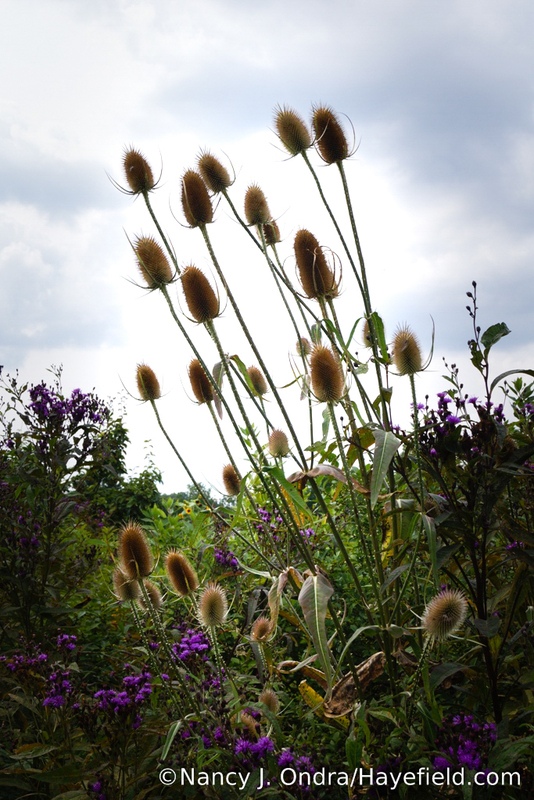 Oh that the billowy abundance of high summer, so beautiful in your images, could linger in our gardens for a bit longer. Here many plants are looking a bit weary with the lack of rain and summer heat. I wish I could send you some moisture and “coolth,” Peter. We’ve certainly had more than our share this year. And yet, the same plants continue to be garden stars. Hooray for tough plants! Beautiful, as always, Nan! Thanks for sharing. Thanks, Barbara, and Happy Bloom Day to you! Hi there, Patty. Yep, the greenhouse was a kit from Cedar-Built Greenhouses in Canada: http://cedarbuilt.homestead.com/ They offer many sizes and styles. Hi Nan! 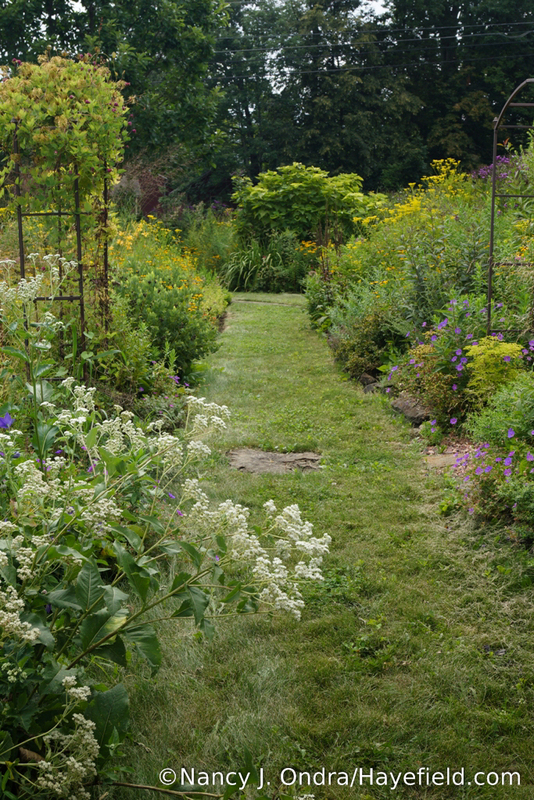 Thanks very much for the tour through Hayefield’s August garden. You are indeed correct in saying there is a lot going on in August. The Hibiscus have really been catching my eye this year and it has been wonderful seeing them weave their way in your gardens. 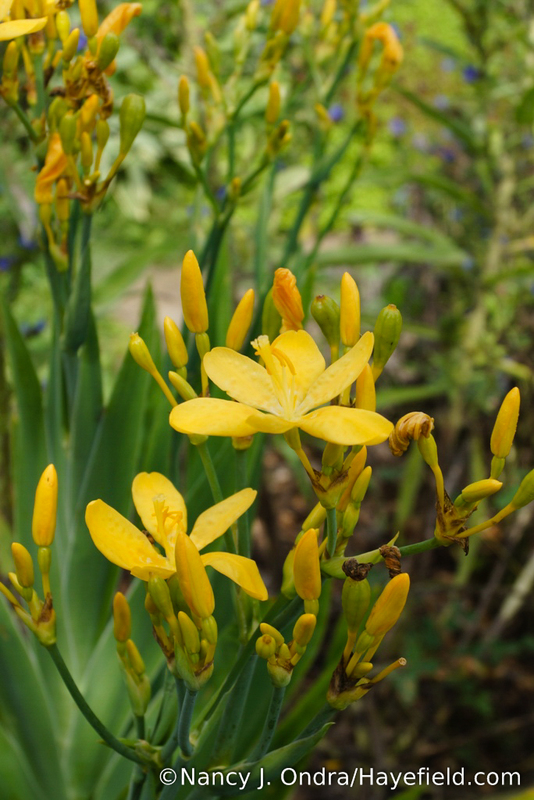 The blackberry lily also caught my attention and it left me wondering how much water it needs to get by. As usual, we’ve had a very dry summer here in Victoria. We got our first short but sweet rain since early June for a few hours on Saturday night. Thanks again. Barbara. Ow, yet another dry year for you? I’m sorry to hear that. 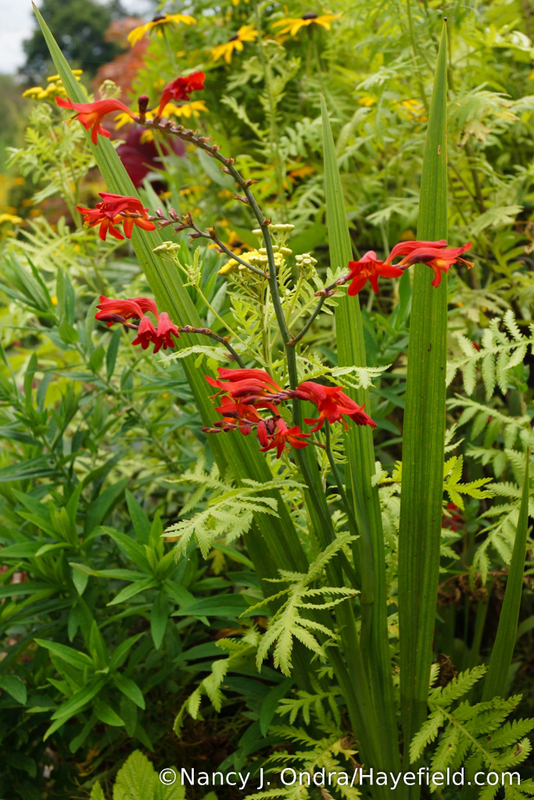 The blackberry lily seems to be very adaptable, so I think it would be worth a try for you. 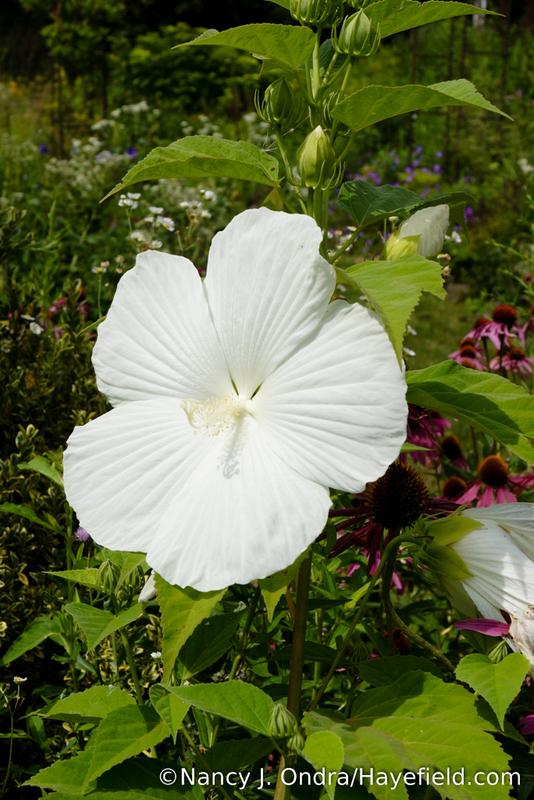 Now, the hibiscus are definitely loving the extra moisture…and the Japanese beetles are loving the hibiscus. It’s always something, you know? 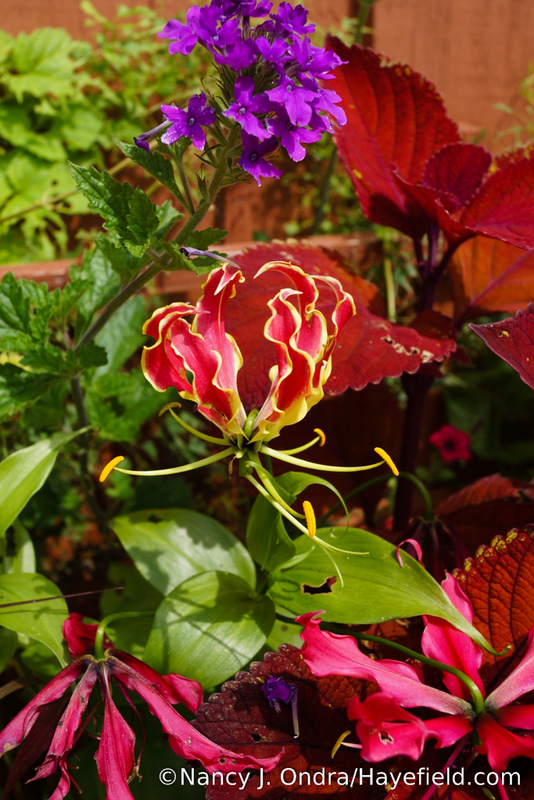 Your garden is exuberant to say the least! While your garden is peaking, mine in SoCal is at its lowest point after months without rain, although unlike the PNW we’ve enjoyed a milder summer than usual thus far. I love all the cheerful yellow flowers you have, your always wonderful plant combinations (especially the one with the Allium seedheads) and, of course, the alpaca sighting. Hey, Kris. With so many folks checking in from areas that have been dry this summer, I’m feeling a bit guilty to be showing off the bounty here this month. Sigh. I imagine we’ll be back to the usual hot and dry again next year. In the meantime, I’ll send some good thoughts for rain out your way, for whatever that’s worth. Duncan says hi! Wonderful. Thank you for posting. Thank you, Jess. Happy Bloom Day to you! 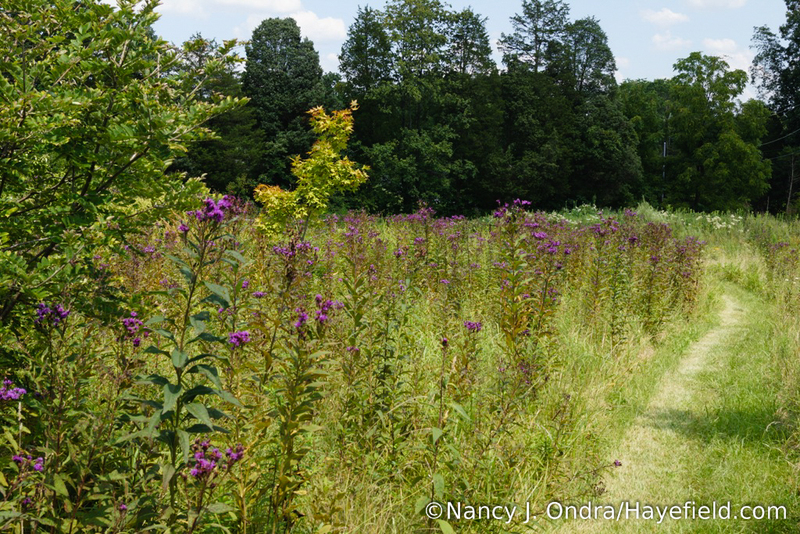 New York Ironweed, now I know the name. I have it growing in the fields around my house and had no idea what it was called. 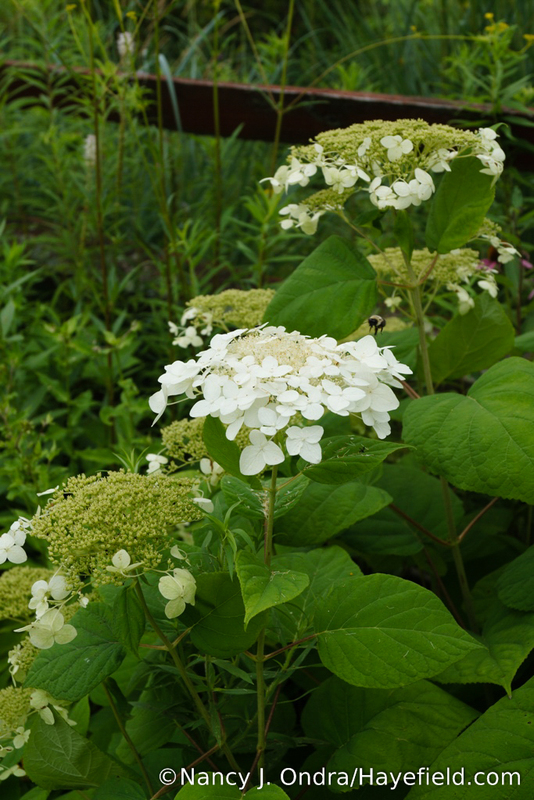 It is beautiful this time of the year but I never thought of letting it grow in the flower bed. Everything is just wonderful. Thanks for sharing on GBBD. Hah – I bet you’ll eventually find it in your garden whether you invite it in or not. Now that you’ve been properly introduced, you can keep an eye out for it. Thanks for visiting today, Jeannie! Nonetheless, thank you for this summery tour thru your amazing garden! Oh, Holly, you’re funny. Though I do have a few (dozen) photos that didn’t quite make the cut for this one…. It’s all beautiful, Nan! So glad you’ve had a wonderful growing season! I remember your drought last year, or the year before. Glorious garden!! Though we can’t pretend to have any control over the weather , we can certainly be grateful for whatever goodness we get, right? I appreciate your kind message, Wendy, and wish you and your garden whatever weather you’d like best. 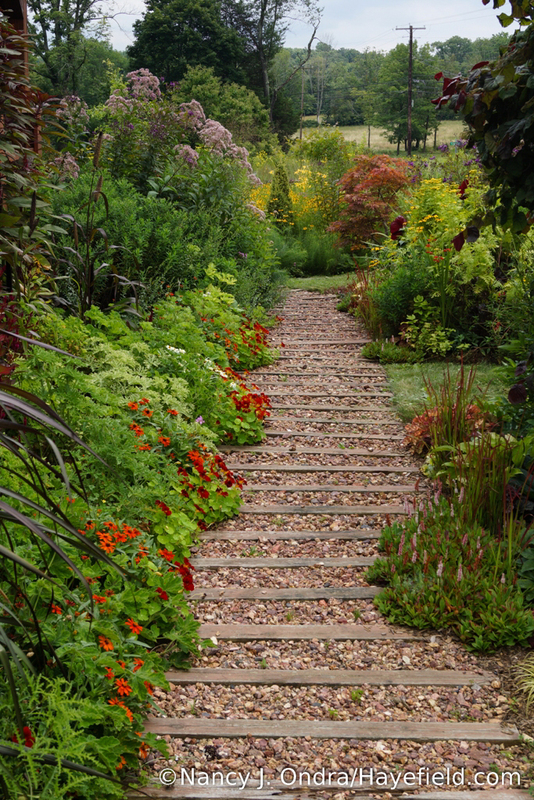 This is a little off the topic of your glorious August garden, but I was taken by the rock and wood path. How was it made? Hi Judith. 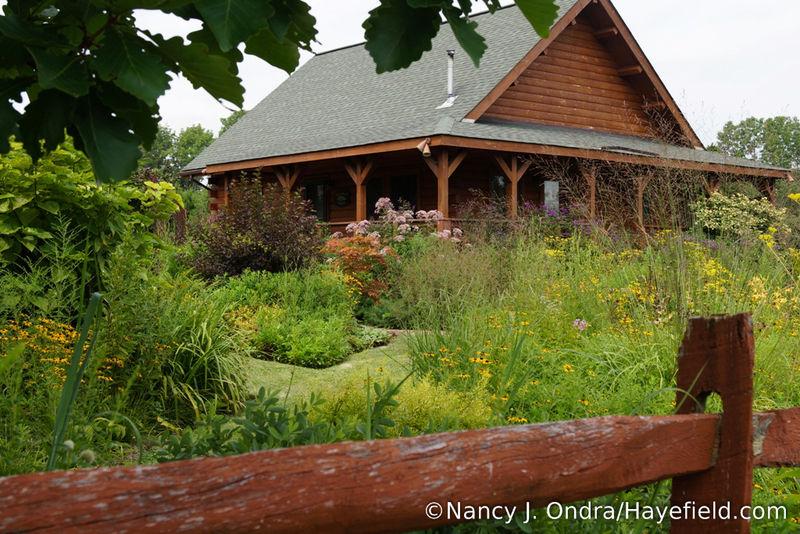 I wrote a post about the construction process when I blogged at Gardening Gone Wild. You can find the post there: Walk This Way. If you have any other questions about it, feel free to ask here or email me directly. What an amazing garden! 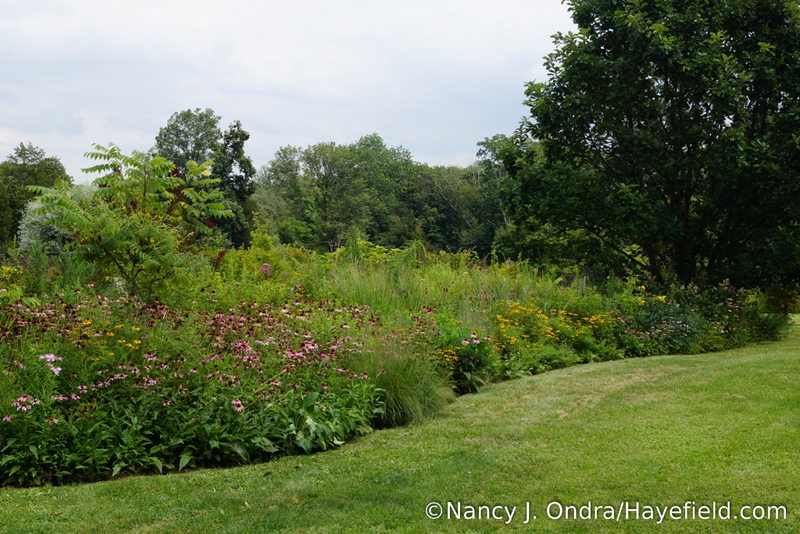 I used to live in PA (in Center County and near Longwood Gardens) and your garden reminds me of my time there. 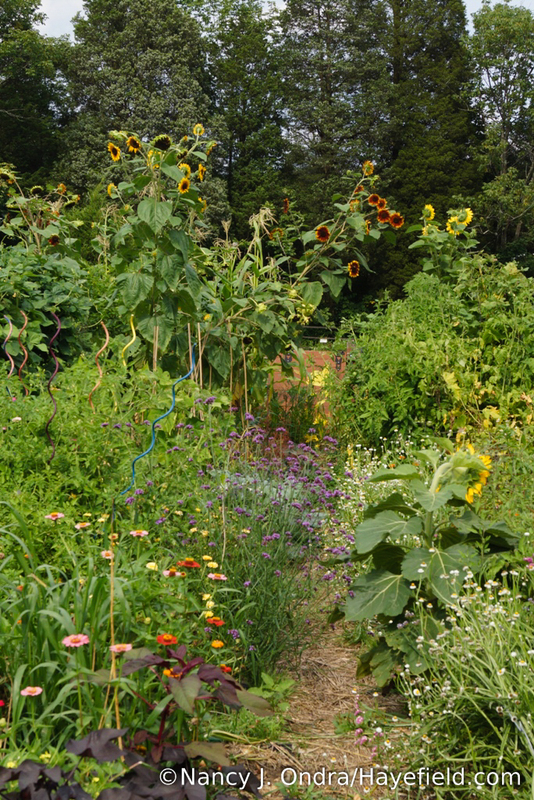 I can only hope that as our garden matures, that it looks this good. The black Scabiosa is fabulous. I really like dark flowers and even had some of this in my wedding bouquet. I also can’t help but comment on your gravel/timber pathway. I love the repetition of it. Really enjoyed your post! Welcome, fellow plant geek! I really appreciate you saying that the garden reminds you of Pennsylvania. 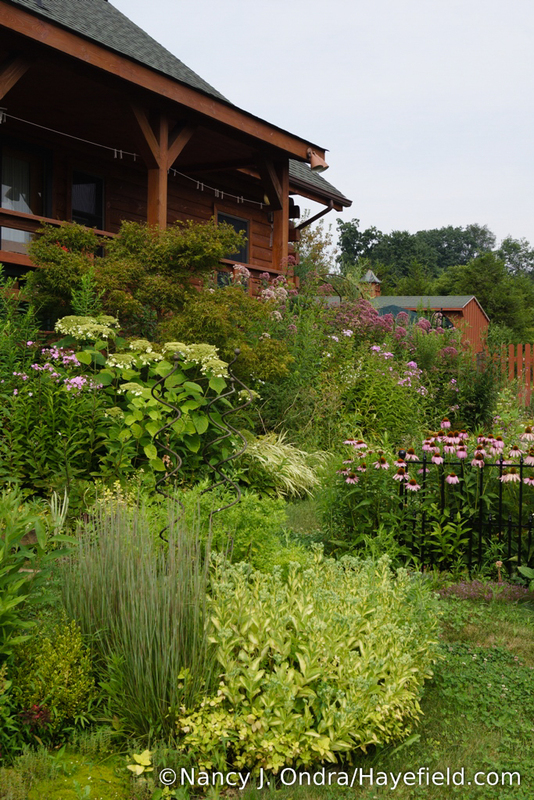 I think it’s ideal when a garden gives you a sense of place, even if not all of the plants are local natives. 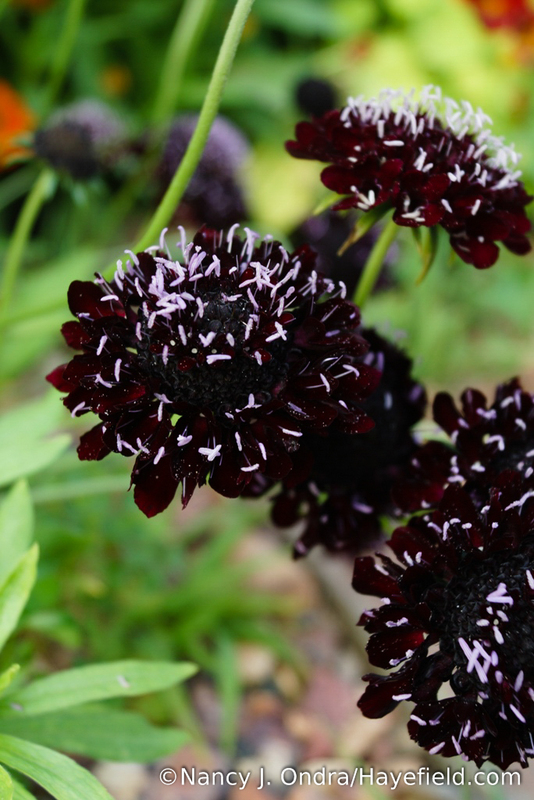 Speaking of non-natives…you’ve reminded me that I need to plant a lot more of that black scabiosa next year. 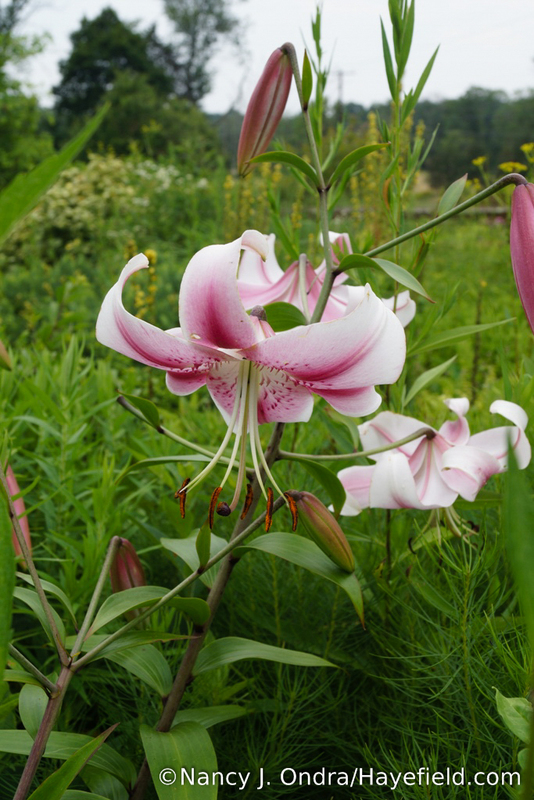 It truly is a treasure for bouquets and gorgeous (if a little sprawly) in the garden too. I wish I could have made ‘Silver Anouk’ as happy in my SoCal garden. Your gardens look as fresh and as manicured as June. Amazingly good, Nan. Thank you, Denise. I wonder what the deal is with ‘Silver Anouk’ thriving in this summer’s humid to wet weather. All of my other lavenders are distinctly unhappy. Based on its eccentric performance so far, I’m tempted to leave it in the garden to see if it makes it through the winter, even though I wouldn’t normally expect Spanish lavender to survive here. I’d sure like to see it in full flower. Great to hear from you, Dee. 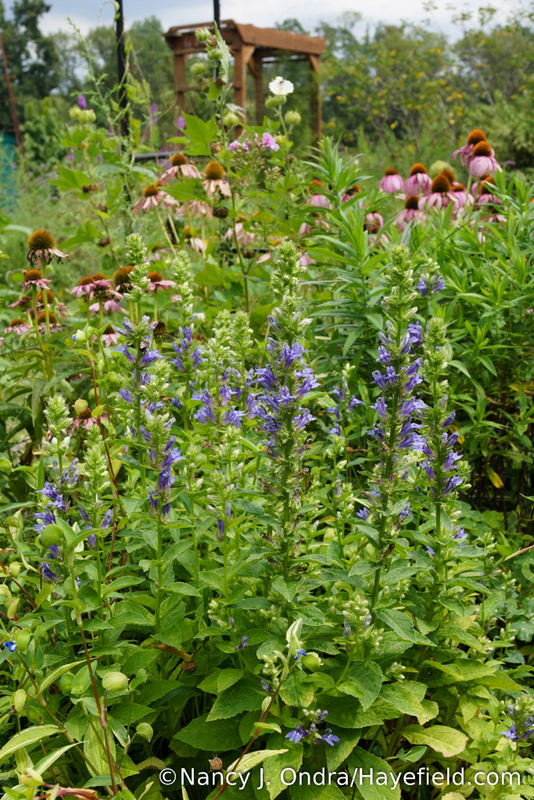 I used to sniff at “common” perennials but eventually came to realize that they’re common for a reason: because they are easy to propagate, easy to grow, and dependable performers. 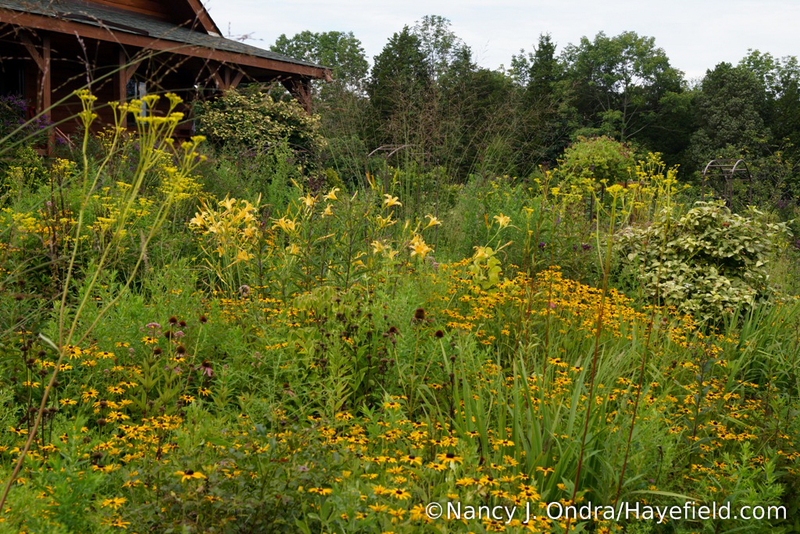 The rudbeckias look as good in your Oklahoma garden as they do here in PA. 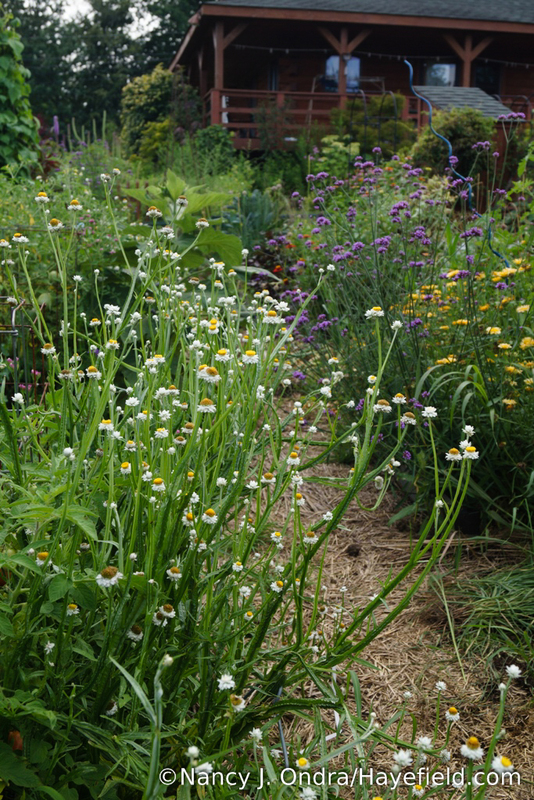 I too am anticipating the flowering of the asters–though if any more bees and butterflies are drawn into the garden, it may become impossible to walk through during daylight hours! We’ve also had an unusual rain and temperature pattern in Kansas this August. Looks like it helped your newer grass paths–almost as interesting as the beds. Your garden looks great, Nan. Best wishes. You’re right, Tom: The rain has kept the paths looking really good. 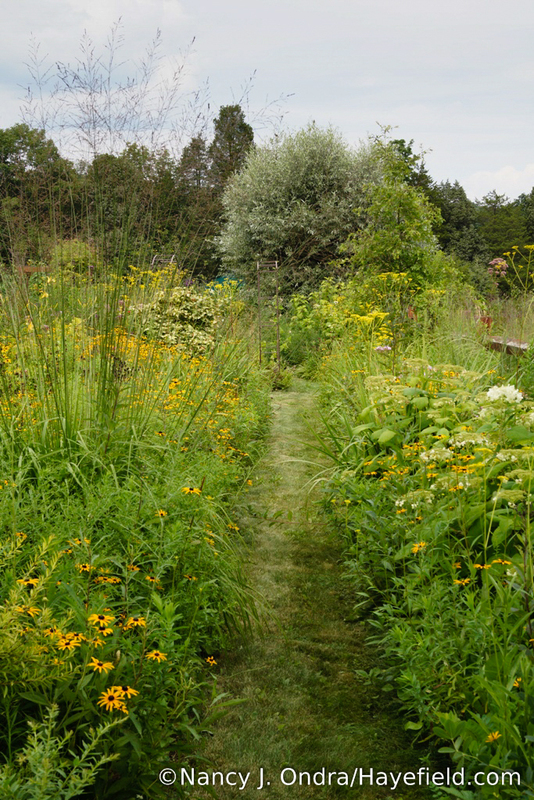 Turning the mulch paths over to “low-mow” grass ended up being an excellent decision, though they do need regular mowing–more because of the white clover that seeded in than because of the grass. The green sure does show off the bright flowers nicely. Thanks so much for taking the tour! Oh my. You are insane and I hope you don’t think that’s offensive. What a wonderful difference the rain has made. 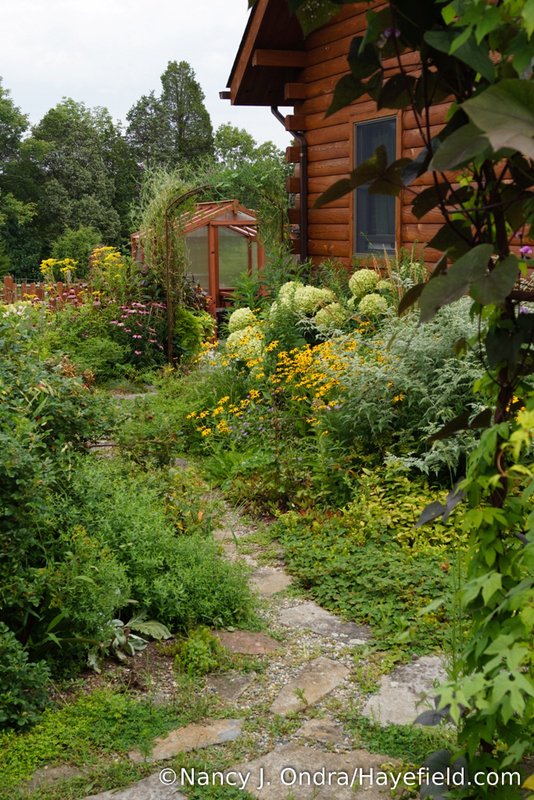 I’m so much happier seeing your gardens so full so I can only imagine how you feel about it! 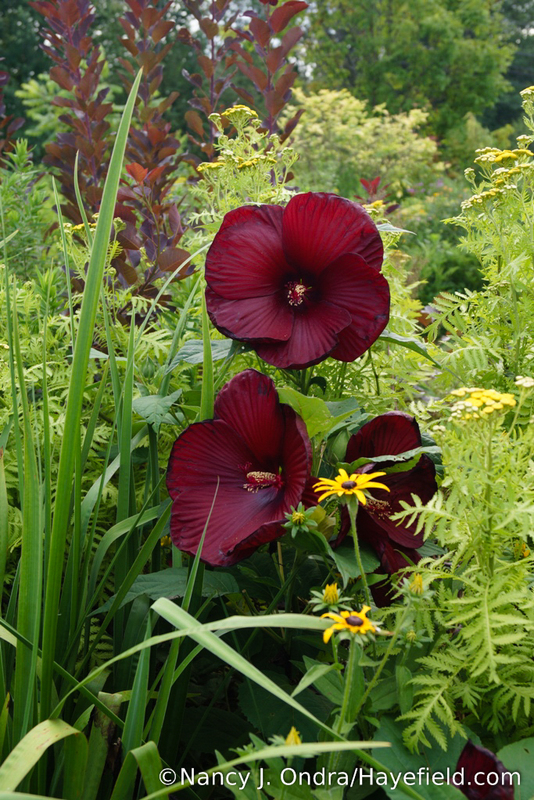 I love the dark hibiscus with the golden background, makes me want to try a few more next year and forget about the beetles and sawflies and dry soils which usually hold mine back. The meadows look fantastic. What a buzzing and fluttering bonanza that must be! 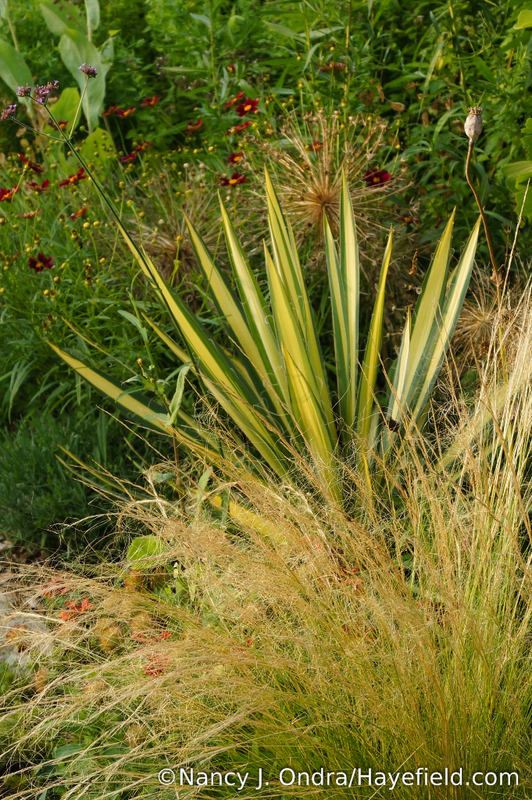 I do see that telltale torn-turf look in the lawn of your arc borders, I’ve banned those pennisetums from my garden because of that reseeding habit. I love your posts, thanks so much for all the work you put into them. Hah – no offense taken. I often feel giddy just looking at the garden, as well as all the birds and bees and butterflies. Well-spotted, you, about where the fountain grasses have seeded into the turf. Sigh. 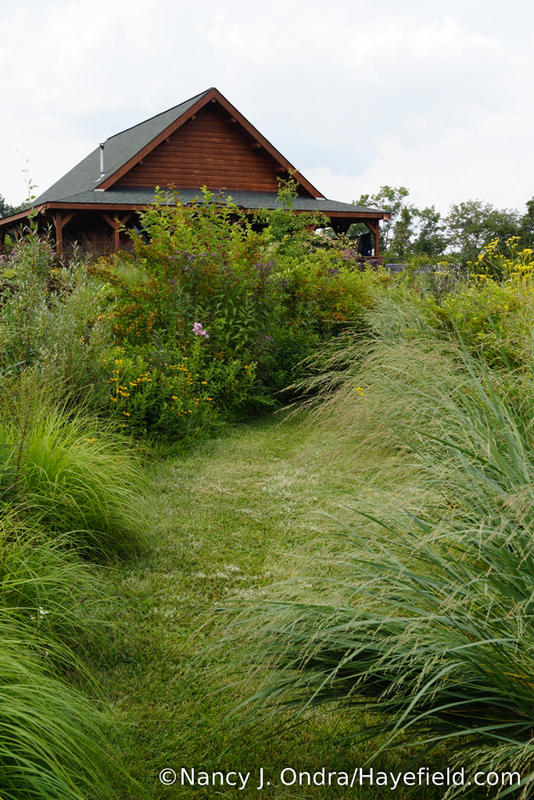 I’m gradually replacing them with prairie dropseed, and I’ve been cutting off their flowerheads for several years now, but I can’t do much those already in the turf. Funny thing: I can even identify fountain grasses by sound–when I run over the few clumps of them that have seeded into the meadow. They are so dense that the brush mower makes a distinctive noise when it goes over them. 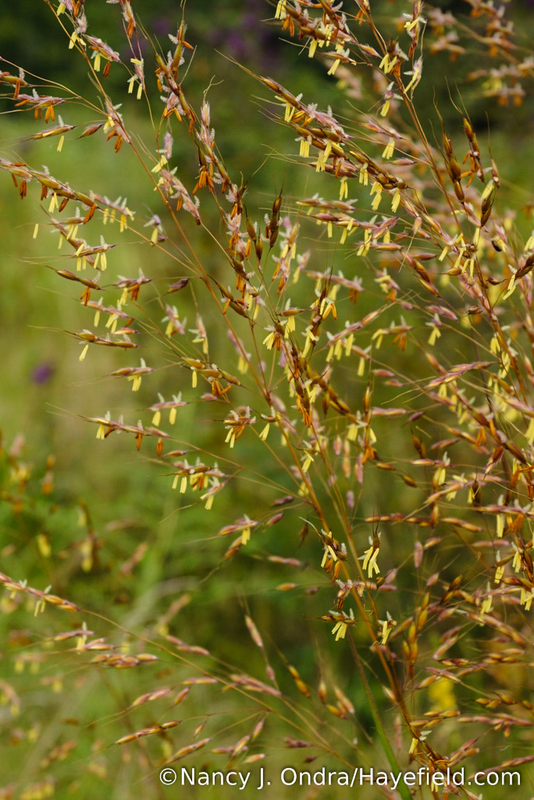 To be fair, prairie dropseed creates a distinctive sound of its own: grind…clunk…silence (what happens when its tough leaf blades wrap around the head of my trimmer-mower or string trimmer–the only disadvantage of using it as an edging plant). You’re thinking about a greenhouse? I’ve been pleased with my Cedar-Built kit on the whole. Mom and I encountered some glitches during the assembly, and of course it wasn’t quite as easy as it sounded, but there were no major problems, and I think it was good quality and a fair price. Wow, what a great tour of your garden. 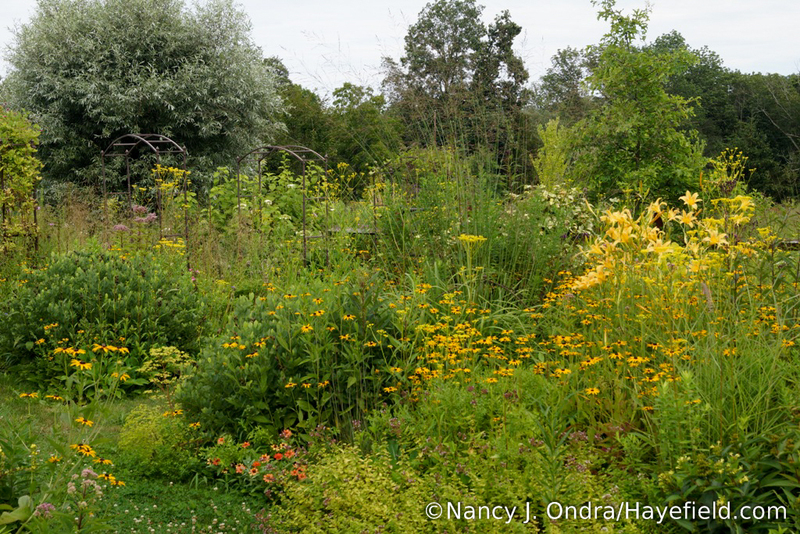 Gardens here in the UK look a little bit sad come August, but yours looks so full of life. 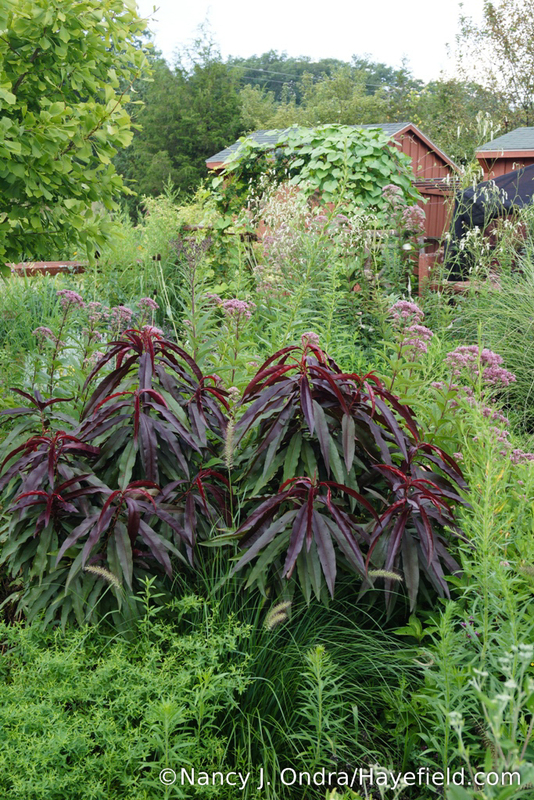 I was especially taken by the pop of purple from the adorable looking peach trees and the coleus ‘Campfire’. Greetings, Carolyn. 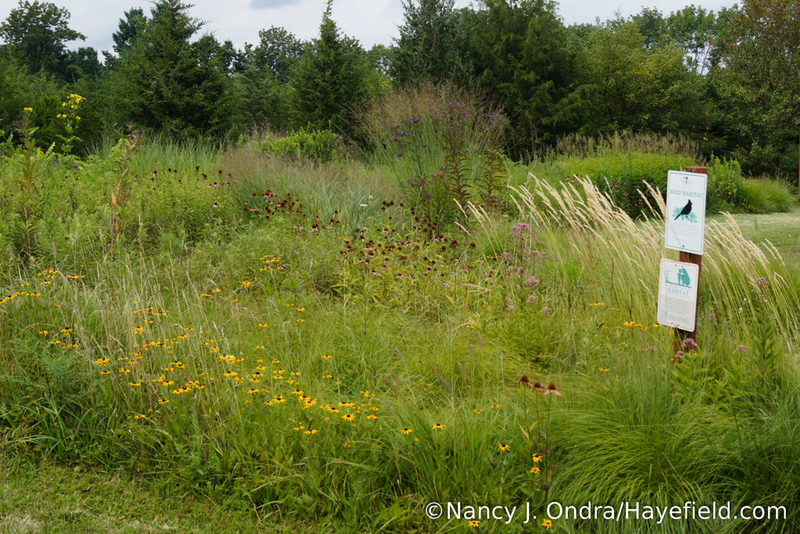 We’re lucky to have some wonderful later-blooming native perennials and grasses here. It sure helps to have a lot of sun, as well. Thank you for taking the tour! I am jealous of your Heartthrob hibiscus. The deer ate the buds off mine. Also chomped on some common magenta phlox and a Hydrangea arborescens–but left the roses alone, which were last year’s favorite. Do you have much trouble with deer? I loved the red peach tree and the dark red scabious, as other commenters have mentioned. Hah – I would have liked to show the ‘Fireball’ hibiscus too, but it is closer to the front gate and got munched when the deer were making forays into the garden earlier this summer. Since then, they’re mostly been congregating in the nearby corn and soybean fields. Nan, I just love your garden. Your use of color and foliage is wonderful. 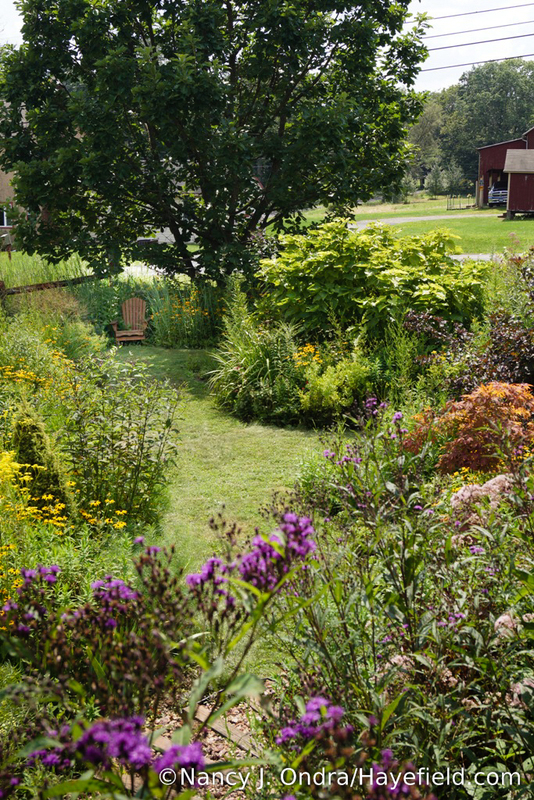 My daughter wants us to turn her front yard into a garden…no grass, just paths with flowers and shrubs. It will be a spring and summer garden, as they are not there in the summer. Your gardens have given me a lot of ideas. You have the best Blog, and I did buy all your books. Thank you for taking the time to write what we are looking at. I really appreciate that. Thank *you*, Judy. There would be little point to blogging without connecting with readers like you. It’s great to hear that you’ve found some ideas for your daughter’s front-yard garden. The only change I’d make to mine–assuming I had an unlimited budget–would be some sort of solid paths. Even the “no-mow/low-mow” grass needs regular edging and trimming, and the previous mulched paths required regular topping-up and a lot of weeding. Some sort of paved paths would also provide something to look at during the winter. Your gardens are wonderful, love that red leaf peach! And the hibiscus! Have never seen the Patrina for sale, it’s a great looking plant. The gardens are the best here they have ever been as we have been getting regular rain, thankfully. I do have hibiscus in bud, can’t wait. 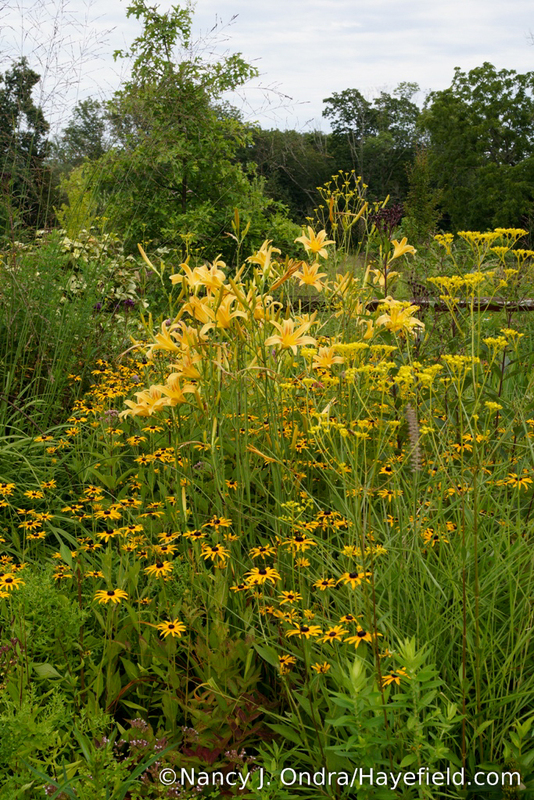 I have been deadheading daylilies and cutting out the gray crap off the rudbeckias. That goes into the green bin. I have a new trick to keep the deer out of the gardens. I use 5 gal buckets turned upside down with empty cans tied together and put on the top of the buckets. Then I string 10 lb test fishing line from the cans to a few bamboo poles to create a string around my gardens, you really have to have a bucket about every 50 feet. The deer walk into the string, the cans fall off and scare them, this has worked for me for the last 2 years, you just have to walk around and check on the cans to make sure they are on the bucket everyday. I always leave it up when we have gardeners visit so they can see it! 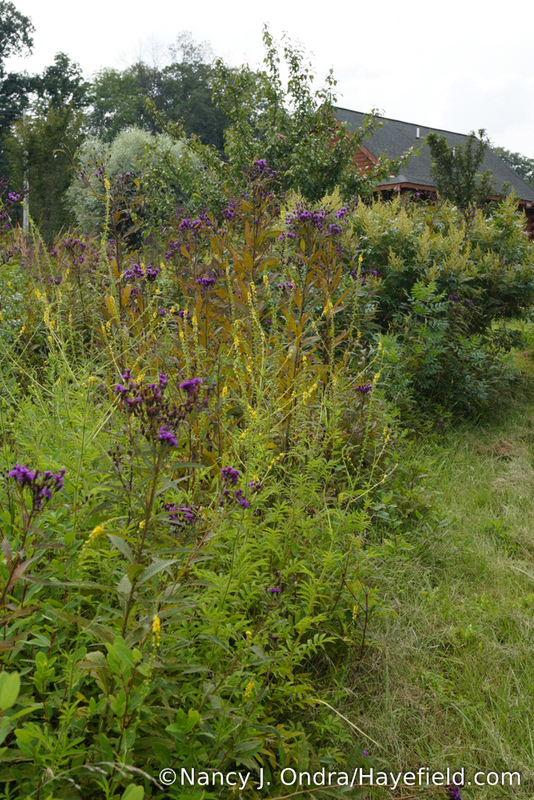 I tried the vernonia from seed but no luck, maybe I should just leave it in the garden over winter. 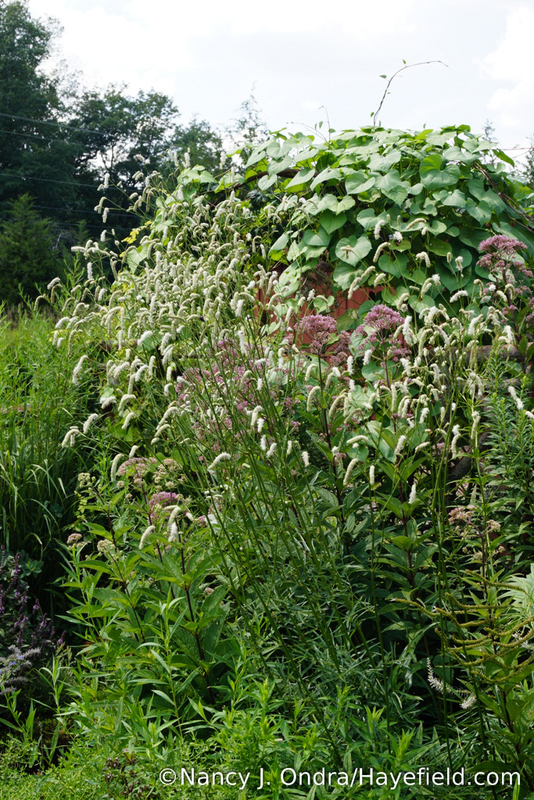 Same with the sanguisorba. 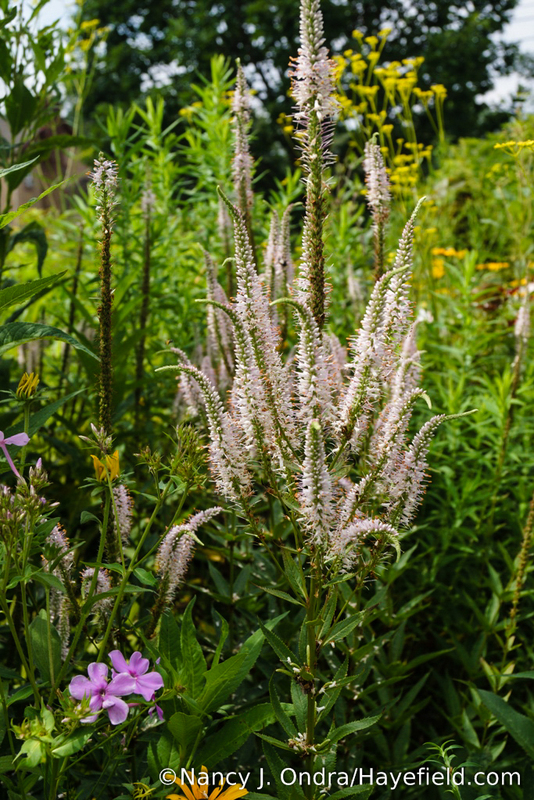 I have lots of fulgida in bloom and it’s backed with persicaria firetail, awesome combination. I eat my lunch in the gardens and love all the colour this time of year. 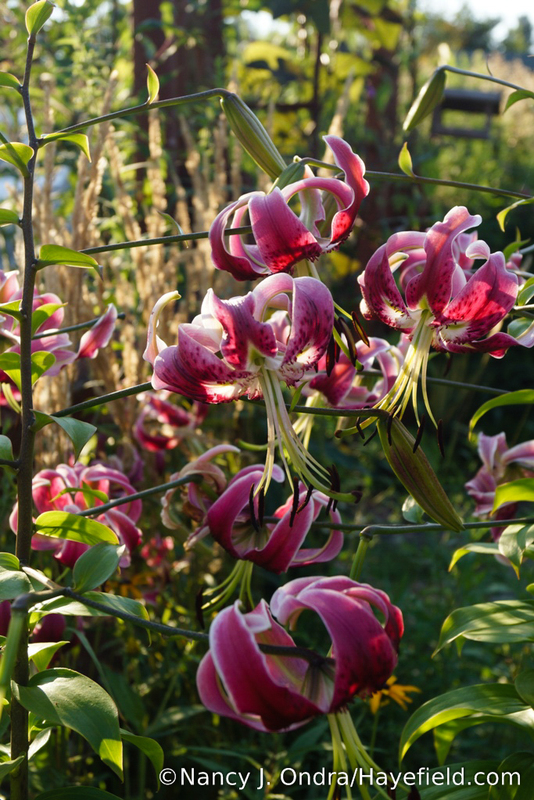 The big lilies are just waning now but I have lots of pots of agapanthus, tigridia, dahlias and calla lilies so when I have a bare spot I just plop in a pot of colour, love this portable colour! So many berries this year especially on the pagoda dogwoods, I leave as many as I can as they reseed and have a wonderful horizontal look. Lots of new birds this year too, must have been the short winter and long spring. No monarchs yet but many other butterflies. Great to hear from you, Sue! It’s lovely that your garden is bringing you such happiness this year. I’m so glad that you can be outside to enjoy it. I appreciate the tip about the deer. As I mentioned in another comment, the deer around here are busy gorging in the soybean fields and have been leaving the garden alone recently, but when they come back, it would be easy for me to rig up something like that over the places that they can easily get in. Thanks! Hi Nan, thanks once again, for brightening up my day, with your lovely photographs and comments. August in the North of England has been a wash out, so much rain, still I suppose it saves on getting the hosepipe out. 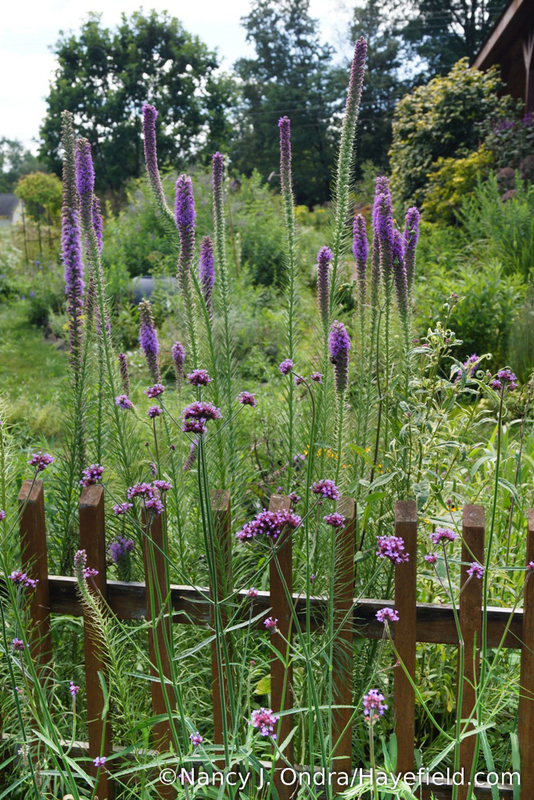 Just one question, is the Liatris Pycnostachya purple? 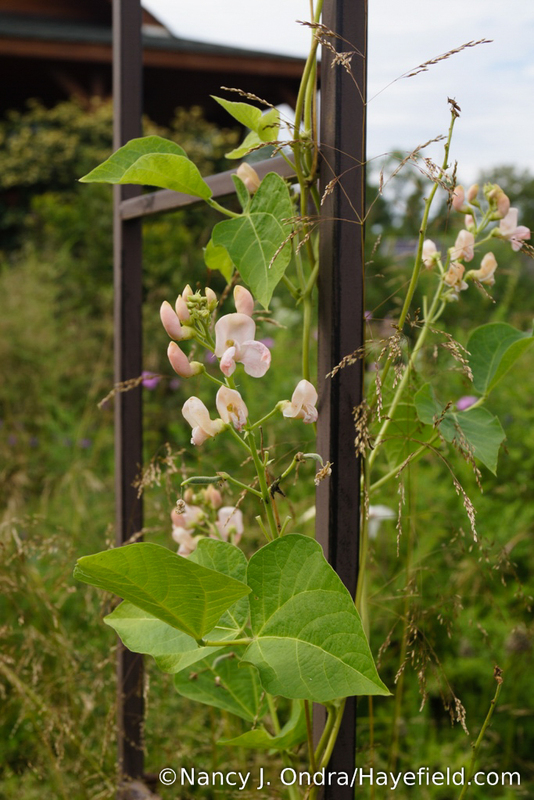 I have looked on line (for seed) and in most of the images it appears to be a dark pink. Hi Allan! Ah, rain for you too; I should have guessed. 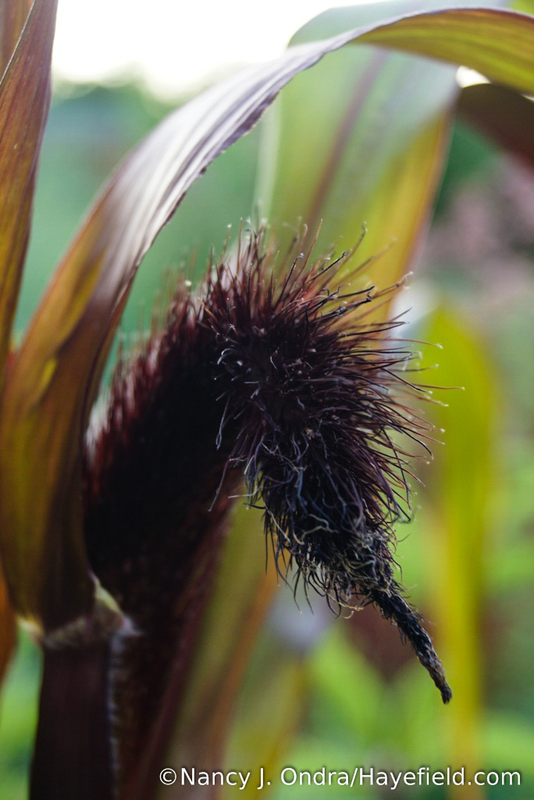 The liatris…well, I definitely wouldn’t call it a dark pink, but not decidedly purple, either. 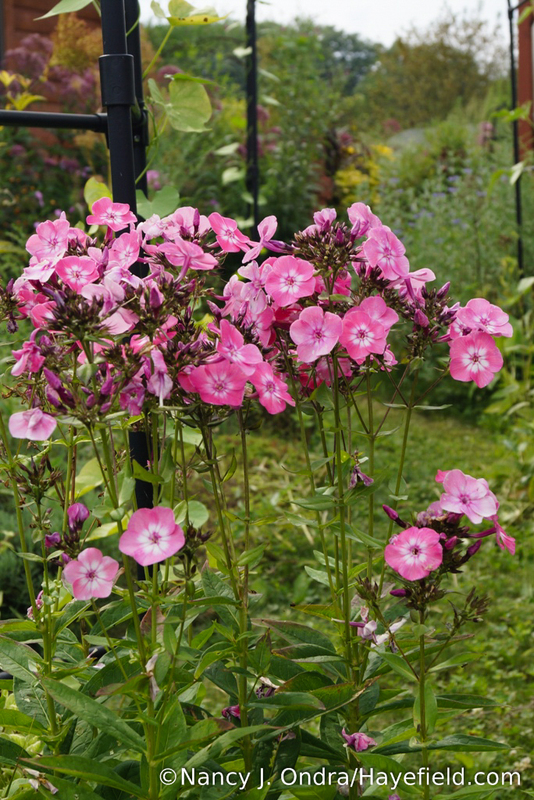 To my eye, it’s close to the color of Verbena bonariensis but with a bit more of a pink tint. I should have lots of seeds this fall if you’d like some.